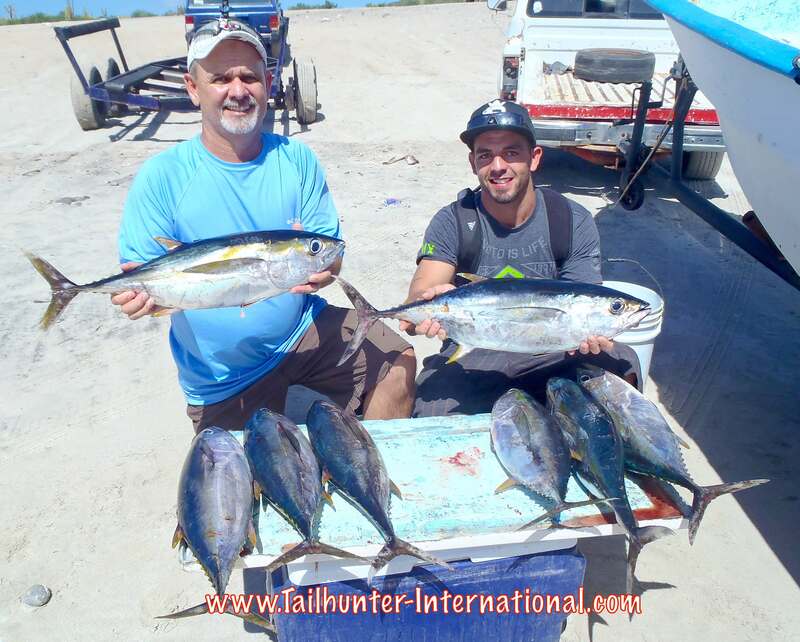 From Kaysville UT, Channing Herrera and son, Kyle, started their week of fishing with a one-hour frenzy of yellowfin tuna. 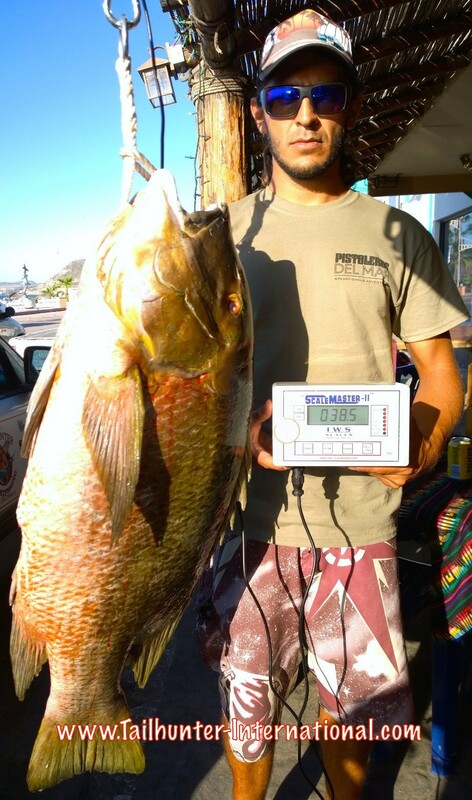 Potential WORLD RECORD FISH on our certfiied IGFA scale…a 38.5 pound barred pargo (pargo mulatto). Matthew Deichsel shot the fish while freediving. He went back to the hotel to take a shower. 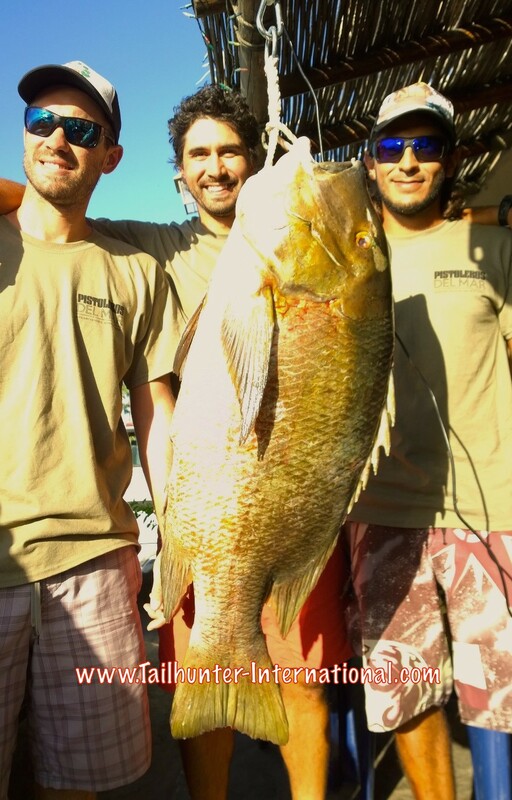 His friends, Patrick Puhlmann with Pistoleros Del Mar here in La Paz, Nick Jones and Leo Tapia thought the fish might be a record so while Matt was in the shower, they ran to our place and we set up the certified scale! The old record on the speargun was just over 37 pounds. This one went 38.5 and is going to be submitted! Another view of the big pargo and weight with Nick Jones. 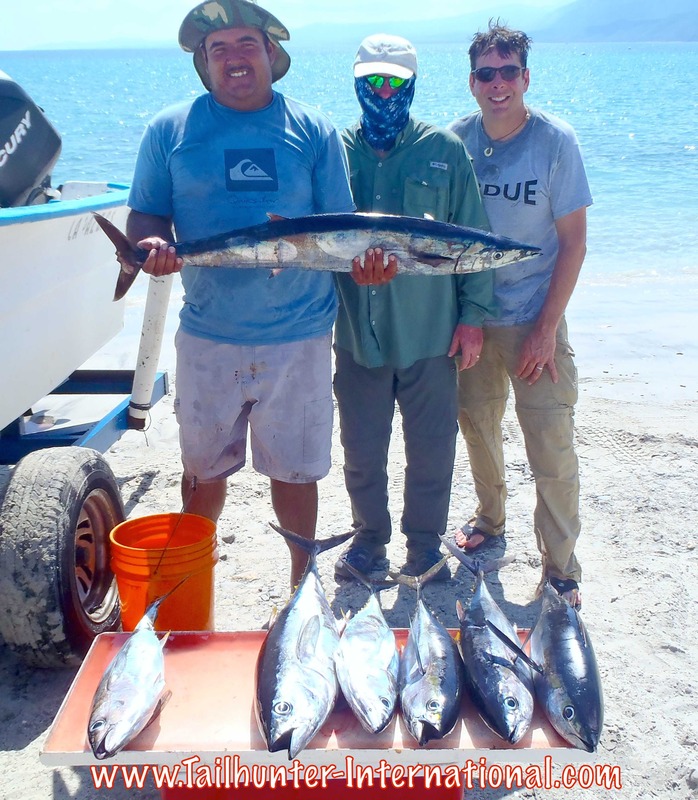 Our own Captain Gerardo with a great day of fishing for Oregon amigos, Mike Stricker and Eric Bean (behind the cool mask) and their yellowfin tuna and nice wahoo. Fishing brings old friends and co-workers together! Tom Mullican from Idaho got together with his friend, John, all the way from New Jersey. 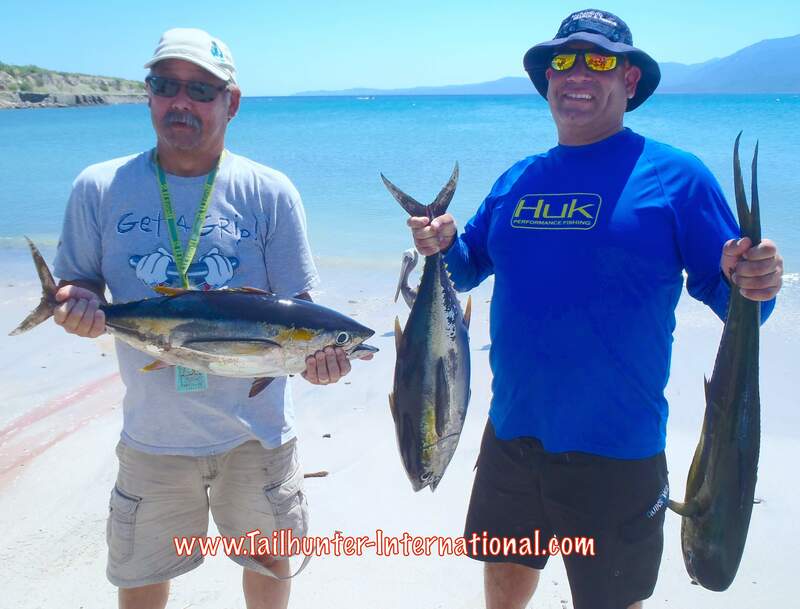 Been friends for 40 years and they knocked out some great tuna out of Bahia de Los Muertos. Check out the big sierra as well. Normally, a cold water fish. The sierra is the 2nd fish from the right on the rack. 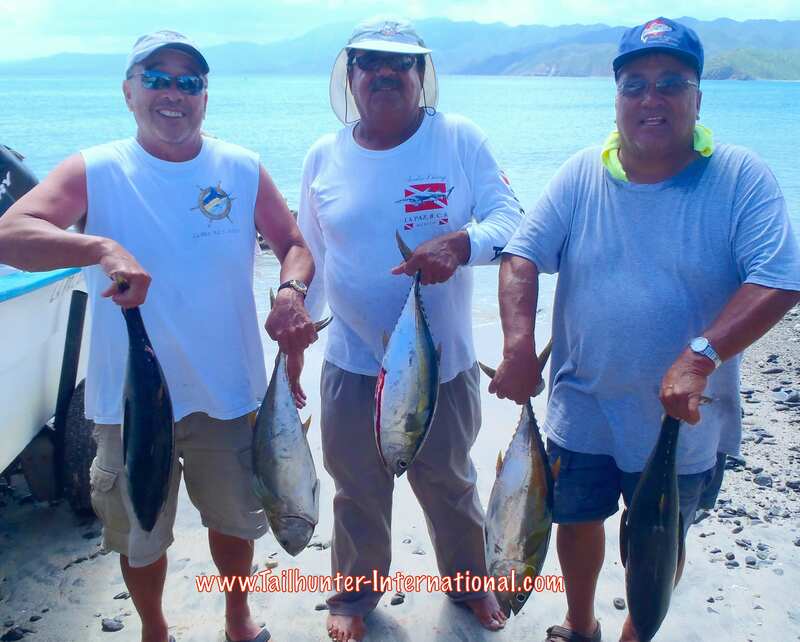 Raphael Rios from Texas and his amigos brothers from Louisiana, Lindon “Lenny” Leishman and Allen “needlefish” Leishman, flank Captain Jorge from our Tailhunter Las Arenas fleet and a good day of tuna fishing. 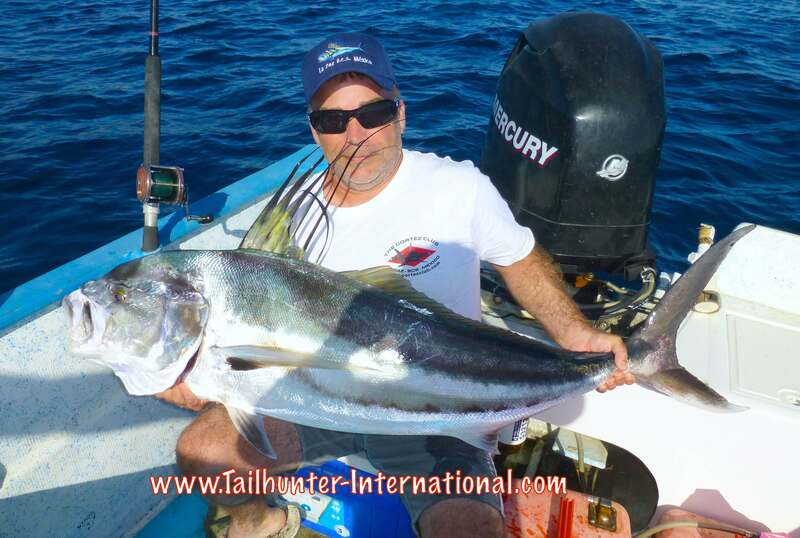 Our new good amigo, Carl Zilinski, came all the way down from Canada to get himself a roosterfish. I told him that there weren’t many around this late in the year, but he buckled down and went for it. He got a little 8-pounder the first day. Mission accomplished! However, his last day, he hit the home run with 2 big 50-pound roosters! All released. Jack Eichhorn from Ahwanee CA lends a hand to amigo, Zach Milano, who hooked this sailfish and had it on for a 20 minute battle south of Cerralvo Island. The fish was not able to be released. 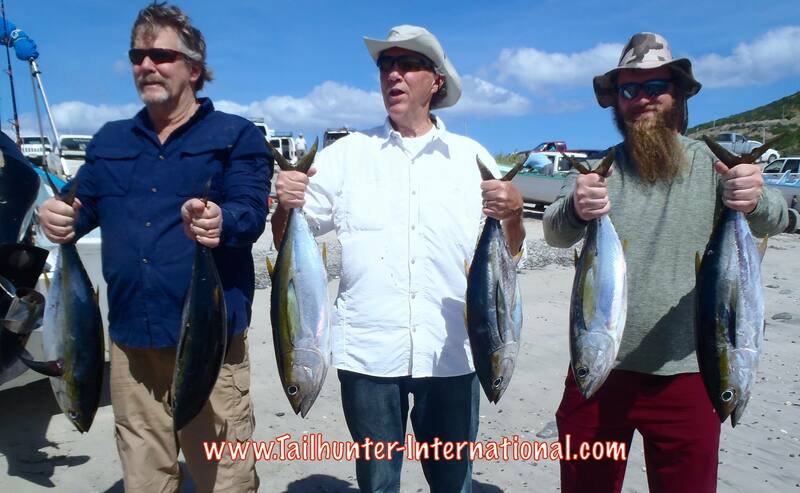 One of the especially really great amigos of Tailhunter who visits us every year…twice this year…Dave Lindell from Pendleton OR with Captain Armando and a few of their yellowfin tuna. From Nebraska, Bryan Sanford, was on his first trip with us and came with brother Craig from Phoenix AZ who’s been with us numerous times. His very first fish turned out to be a striped marlin. Captain Armando helps out with the photo. 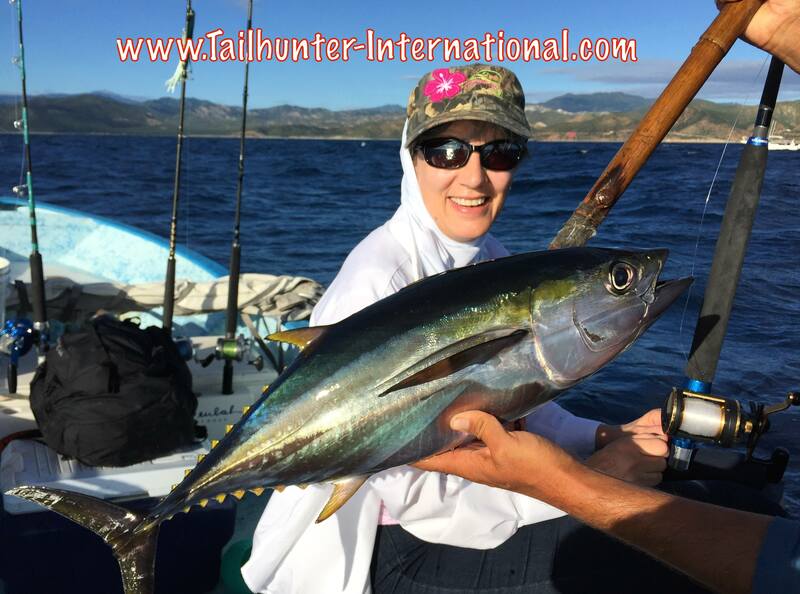 Captain Archangel with Lillian and Rich Braughtigam from Phoenix and their first day on the water hitting a nice bit of yellowfin tuna. Wahoo for Al Salmen mid-week when the wahoo showed up for a quick run! The Montejano brothers…Rafa and Andy only had two days to fish this year, but got tuna one day and dorado the next. 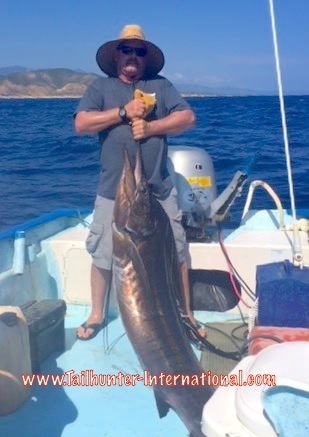 The original “Gangsta Perch” amigo who is usually ice fishing in Montana, Bill McDaniel and Captain Eddy were fishing Espirito Santo Island when this striped marlin bit. Could not be released. Nice mix of fish…yellowfin tuna…yellow snapper…cabrilla for brothers Bryan and Craig Sanford and Captain Armando. 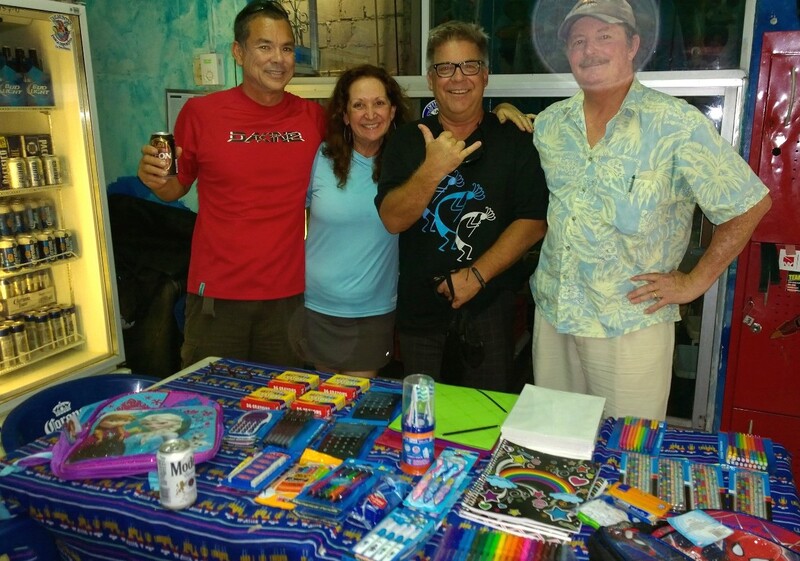 I think I’ve known these guys for about the full 20-years I’ve been in La Paz. 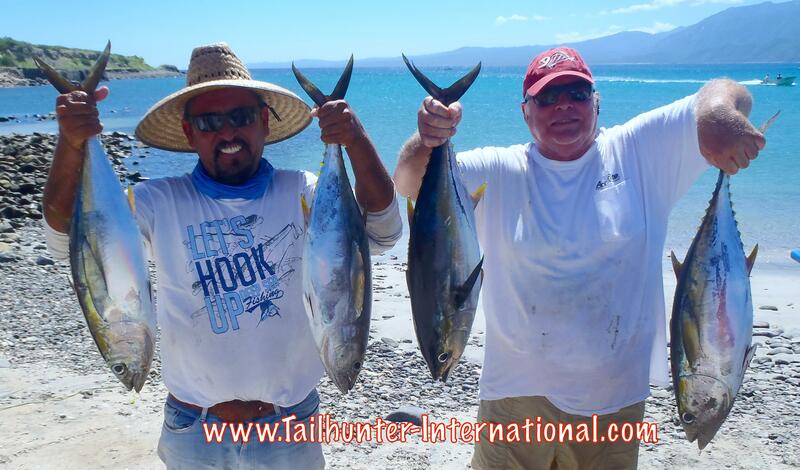 From Moscow, Idaho, Jim and Jeff put some football tuna in the boat to start things out for the week. 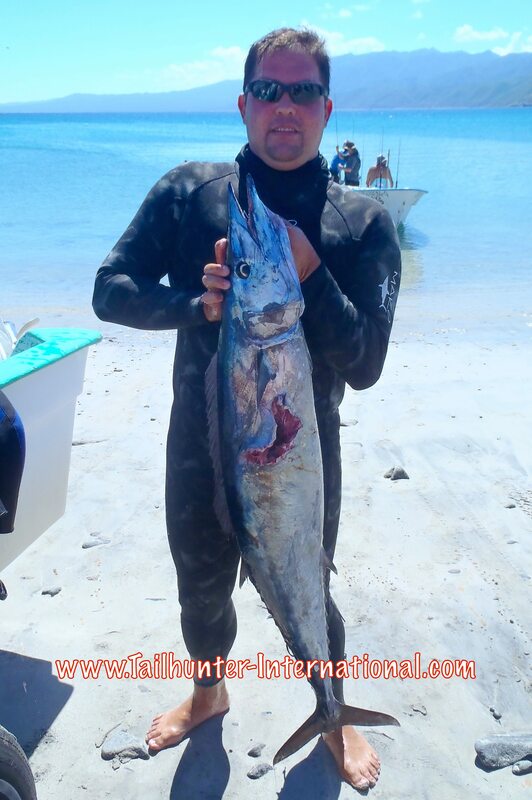 Raphael Rios from Texas fished 3 days with us along with Captain Jorge and his amigos from Louisiana. They plugged a few ice chests with the yellowfin. Good way to start a fishing trip. 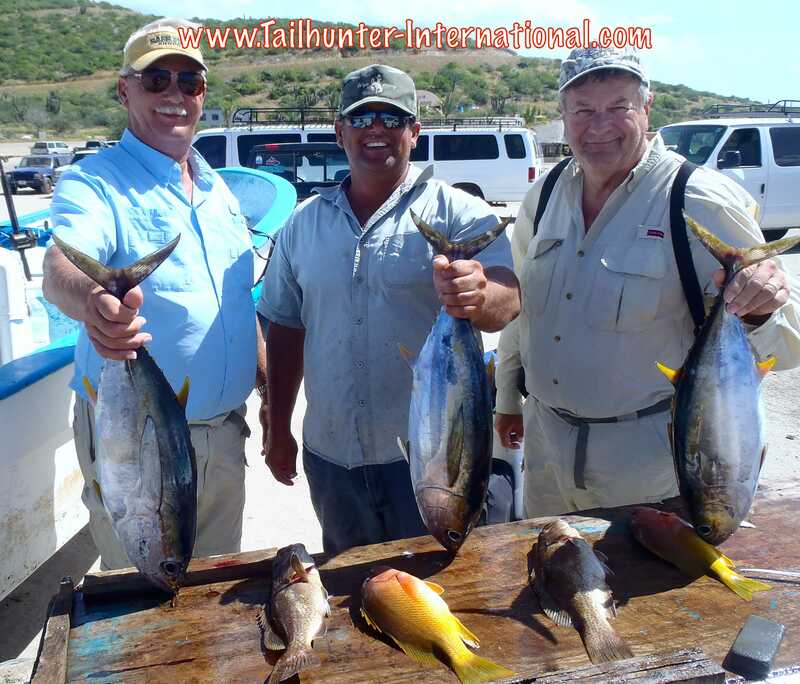 Dave Milano flanked by Zach (right) and Dana Milano (left) all holding yellowfin tuna at Bahia de Los Muertos. And yet one more wahoo! A sweet one for Florentino! Thanks to all of you who wrote or called us to ask if we were OK with Hurricane Patricia that slammed into the Puerto Vallarta/ Manzanillo areas. However we’re 500 miles away and were not affected by the storm which has been called the strongest hurricane on record in the western hemisphere. Poor folks had 200 mile-an-hour-winds and lots of rain. Thankfully, damage and injuries were much less than anticipated. As many will remember, only last year, Hurricane ODILE slammed into Southern Baja tearing La Paz, Cabo San Lucas and many areas up pretty badly. In many ways, we’re still mending. Fortunately, for us, Hurricane Patricia went south. Still, it DID affect us. Big wind and waves hit us late in the week. I mean, big chop and big rollers unlike anything we get here! Sea-sickness is not something we usually have to deal with here because water are so calm, but folks were taking dramamine and we had more than a few tell me they got queasy. It was not easy fishing. The upturned water also affected the fishing insofar as it make the waters dirty and moved the bait around which was harder to catch. Our captains and fishermen really had to work hard for fish this week. I think this is one of the few times this year where I can say the fishing was actually better in this area and with our fleet than with our La Paz fleet fishing north out’ve town. Our Tailhunter Las Arenas fleet at least had the nicer football tunas to play with. Fish in the 8-20 pound class at least put some quality fillets in the box. It wasn’t wide open by any stretch, but the boats got 2-9 fish per day and it changed daily and from boat-to-boat often fishing right next to each other. Just came down to dumb luck sometimes with no rhyme or reason as to why one boat would get bit and others would goose-egg. 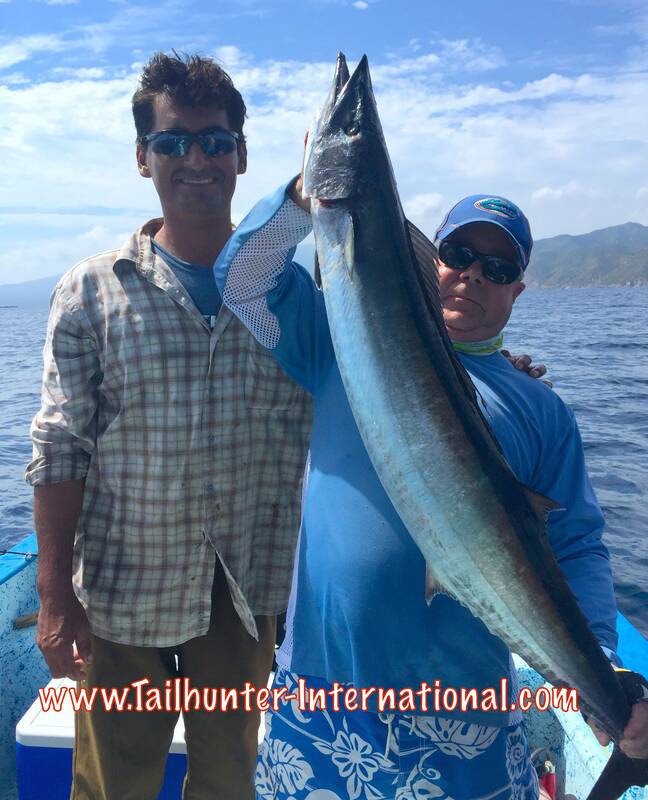 But, the fish were there and made for fun when mixed with the other species like bonito…some wahoo…as well as some decent billfish too! It was honestly a struggle this week. 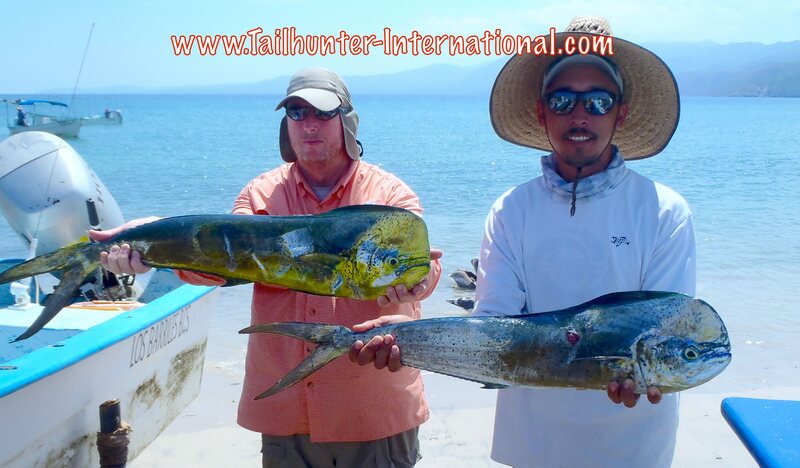 La Paz fishing and our La Paz Tailhunter Fleet have been our wild card ace all year. At least the small dorado would provide ready action and help fill the chests. The fish were often close to shore and the bay and voracious. This week, it was a struggle. Bait was small and difficult to get. The bigger body of fish was all the way on the other side of the bay near San Juan de la Costa…a pretty far run. One of our pangas would get 6 or 7 dorado up to about 10 pounds and others would get 1, 2, 3 or even none…just lots of bonito biters. 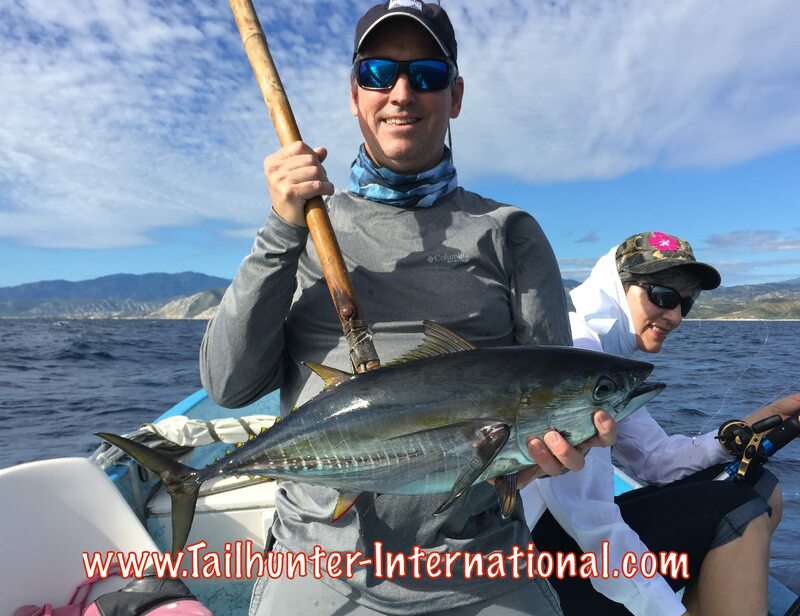 Combined with the big winds and chop from Hurricane Patricia, it was not easy fishing. Fortunately, that’s why we have two fleets and we had most of our folks fishing with our Las Arenas fleet so they at least had shots at tuna and wahoo. Always so generous. From Pendleton, Oregon, Dave and Malina Lindell visit us every year…sometimes twice a year like this year! And, they have the biggest hearts in always bringing down things for the kids and families. Check out the cases of new toothbrushes, being held by Dave and Jilly! Much needed items! 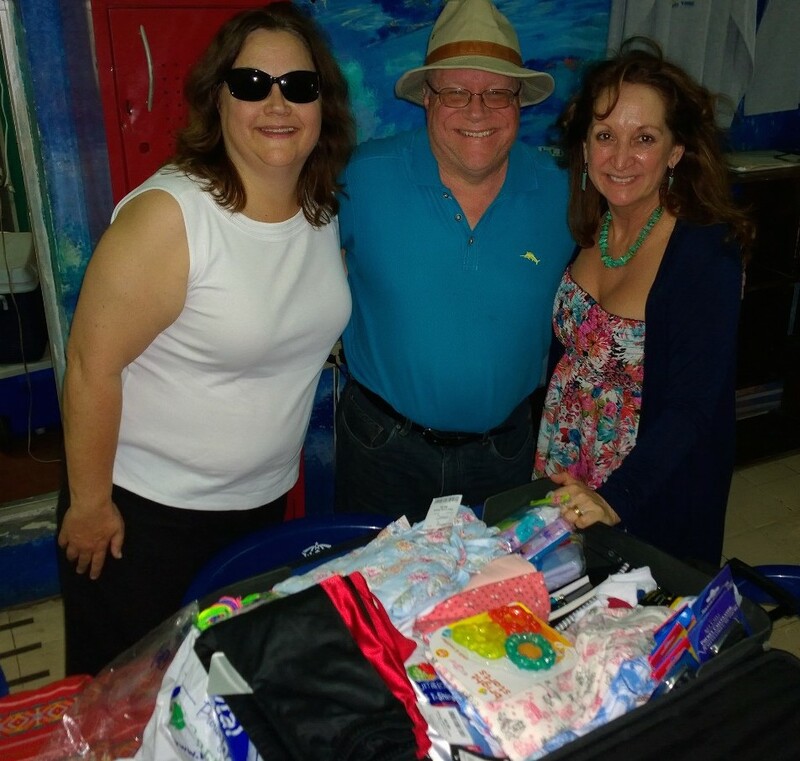 Sue and Richard Marksberry hauled a 50 pound suitcase full of kids clothes and school supplies from Washington DC all the way to La Paz to donate to the PACK FOR A PURPOSE PROGRAM. 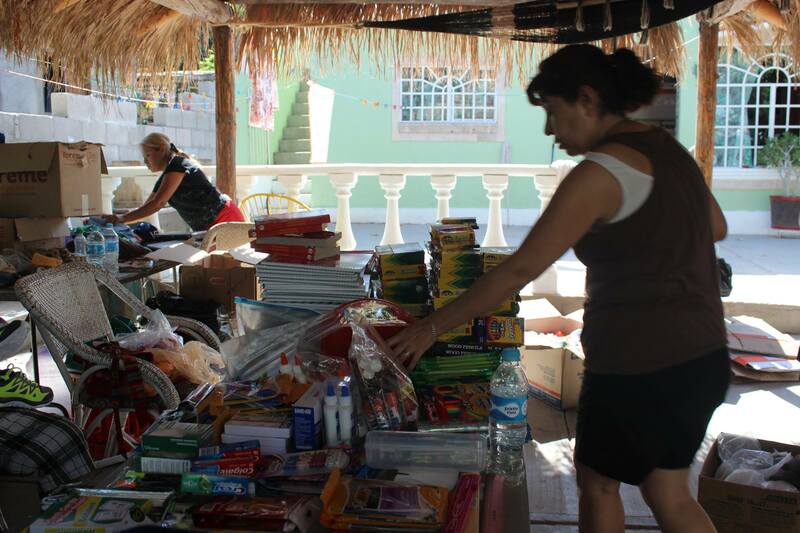 Kids clutching bags of paper, pencils, crayons, toothbrushes and toothpaste! Like gold! 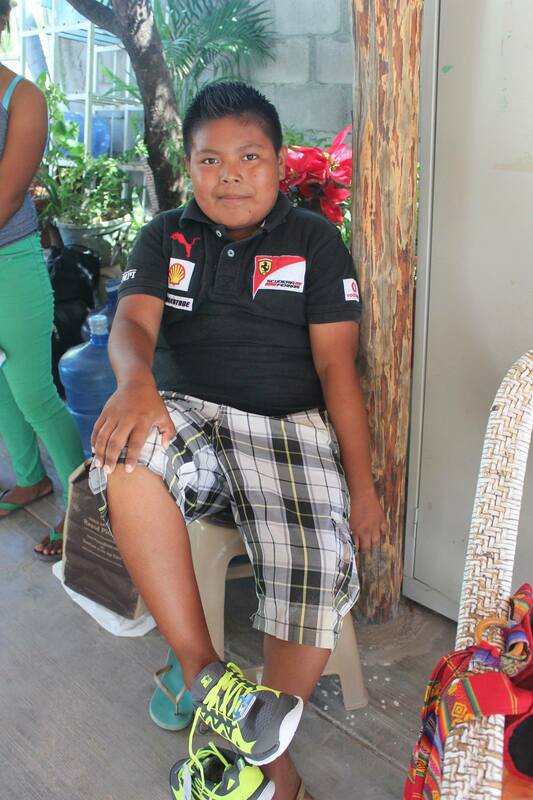 A new pair of shoes for this young man! Moms got to go through the stacks of things you brought down and make bags for themselves and their families…school supplies…toys…clothing…hygiene…shoes…things so many of us take for granted. 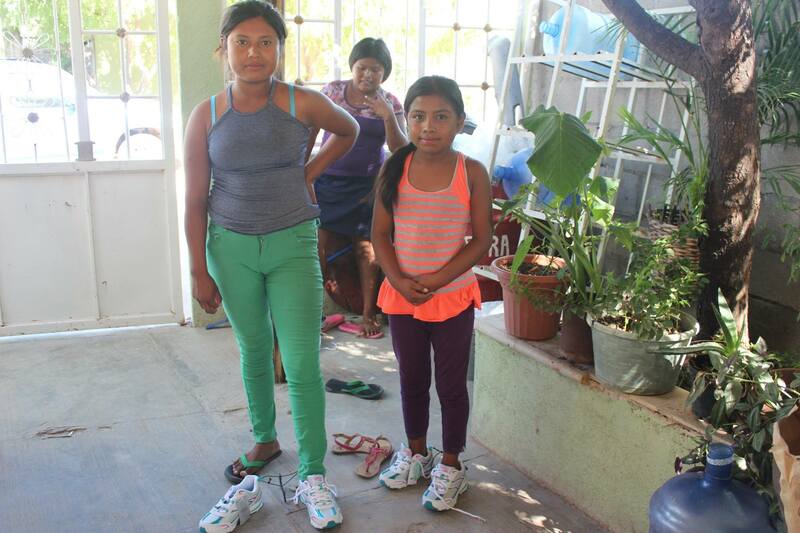 New shoes for these young ladies! 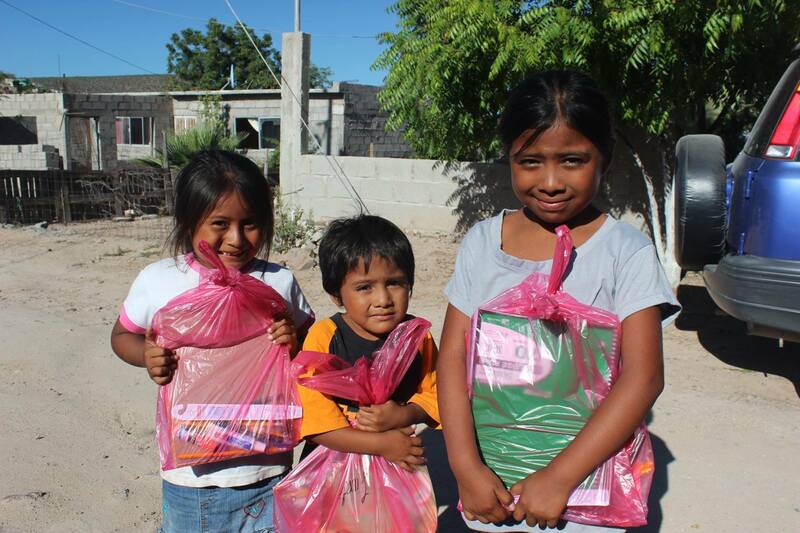 Smiles for things they would not ordinarily be able to have for school. Simple notebook paper and pencils! For over a year now, you, our awesome friends and fishing clients have been bringing us so many incredible donations for our Pack for a Purpose Program. 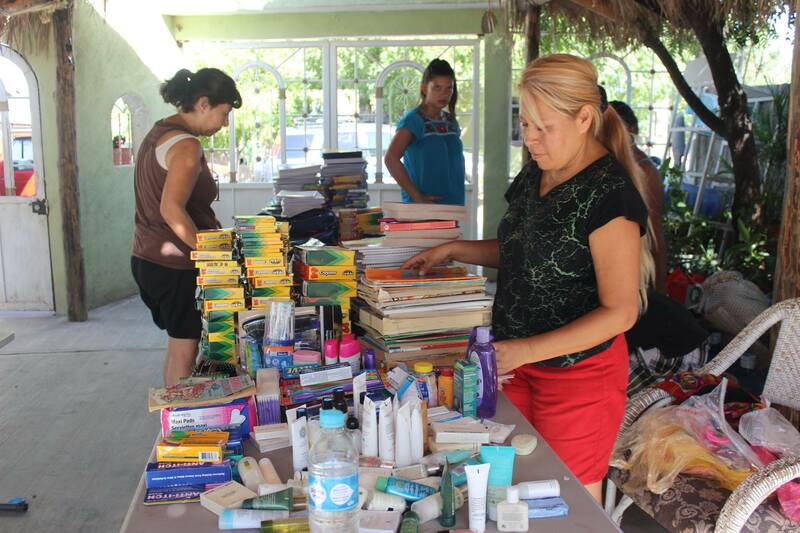 To date, there’s been over 2000 pounds of goods delivered and all gone to great use. For those of you who don’t know, my wife Jill spearheaded the program and it basically works like this. Folks are coming down to fish. They bring down empty ice chests that they have to pay for anyway to bring down so they can haul fish home. We ask that if you can, set aside a little space (doesn’t have to be much) and bring something down for some of our charities down here. Every little thing counts. Well, our Tailhunter Tribe has responded. Every week entire ice chests…full suitcases…boxes come in with so many fantastic things. Every week, I post photos of some of our generous donors! But, rarely do you folks get to see where all the good is being done. 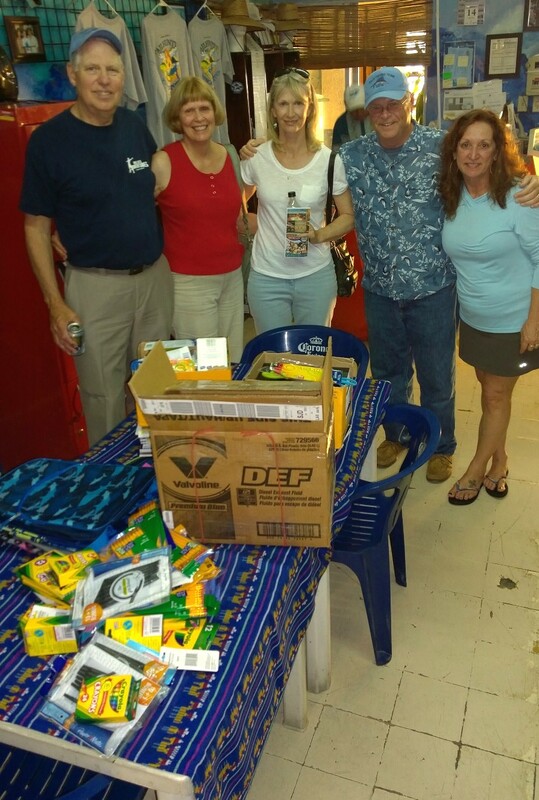 This week, I posted up photos from the Care for Kids La Paz operation where the most recent batch of donations went. 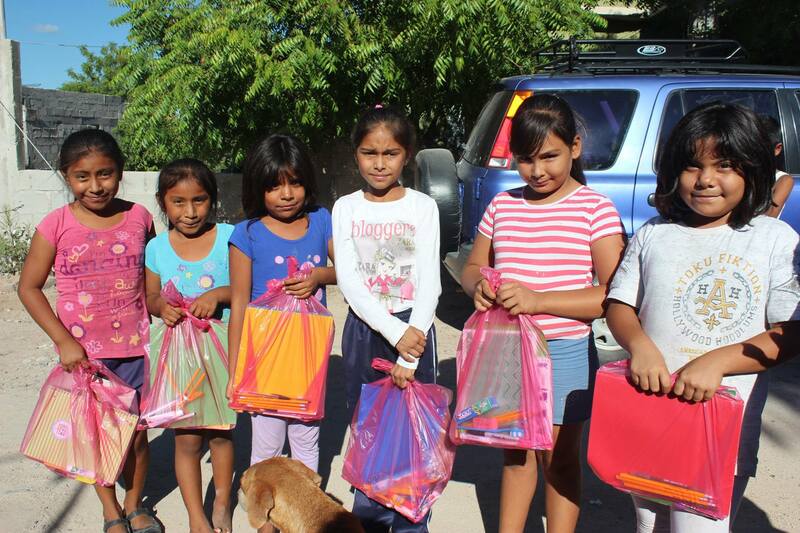 Donations go here as well as some impoverished schools out in the desert and also the battered women’s shelter. We wanted you to see some of the smiles YOU all provided in a place where even a simple pencil or toothbrushes and toothpaste can make a difference. Also, many of our clients leave us money as well. That money goes towards the FANLAP Scholarship program to help put kids through school. Here in Mexico, after 6th grade, education is not guaranteed and families must pay for further schooling. Jill and I just wanted to say thank you! First timers from Washington! 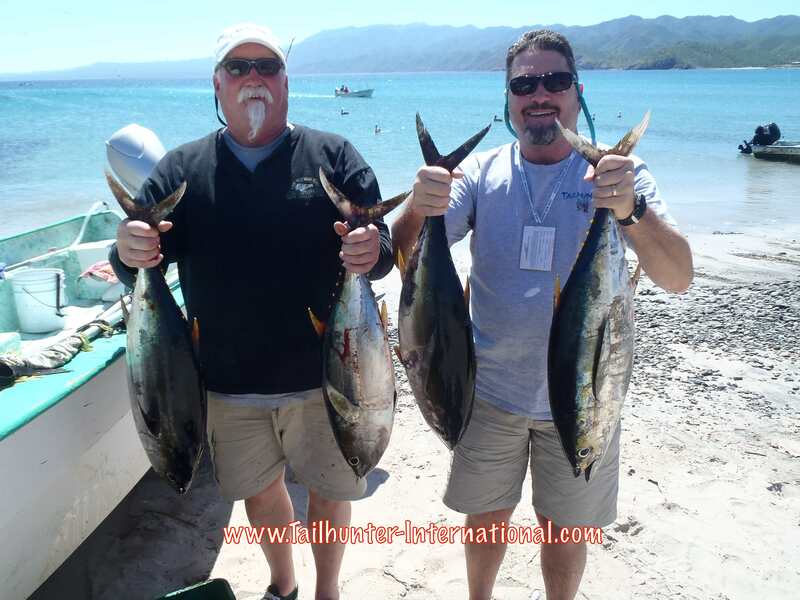 Great to have Bill Bigelman and John Stendra with us and have them get into the tuna bite at Bahia de los Muertos. One of our favorite amigos! Firefighter Ken Campbell says La Paz is his “happy place” and he had a great week. 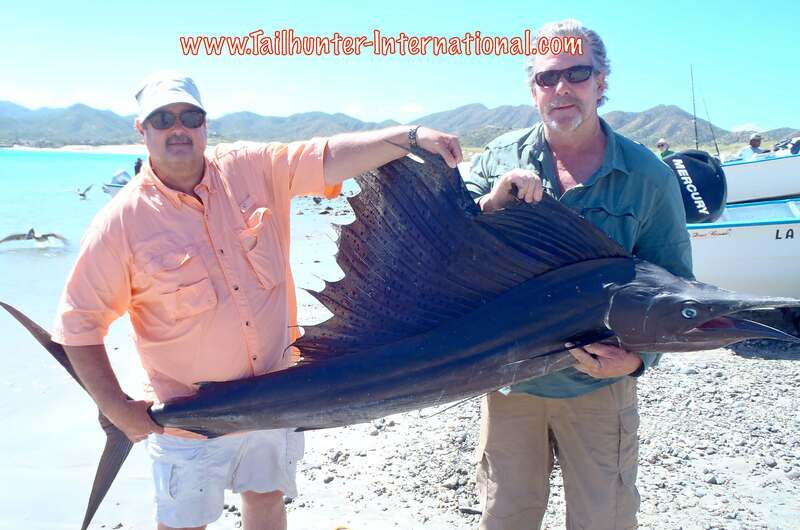 He got his first sailfish off Cerralvo Island. They tried to revive the fish, but were unable and he donated all the meat to the pueblo. He fought the fish for 90 minutes on 20 pound test and tells us the fish was actually tangled and had lassoed itself into knots of line around it’s head. Also interesting because he was fishing deep down with weight to get away from the bonito on the surface! 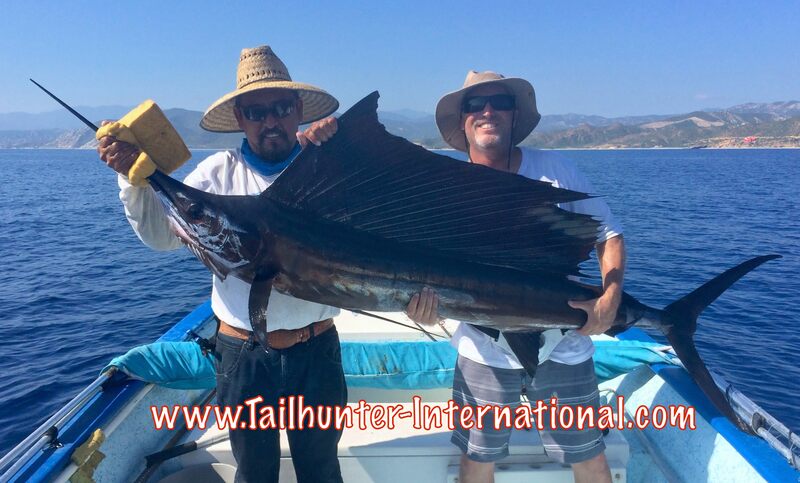 Captain Jorge protects his hands with the boat sponge and Wiley Randolph’s first sailfish! They got it on live bait and Wiley nicely released the fish after the photo. 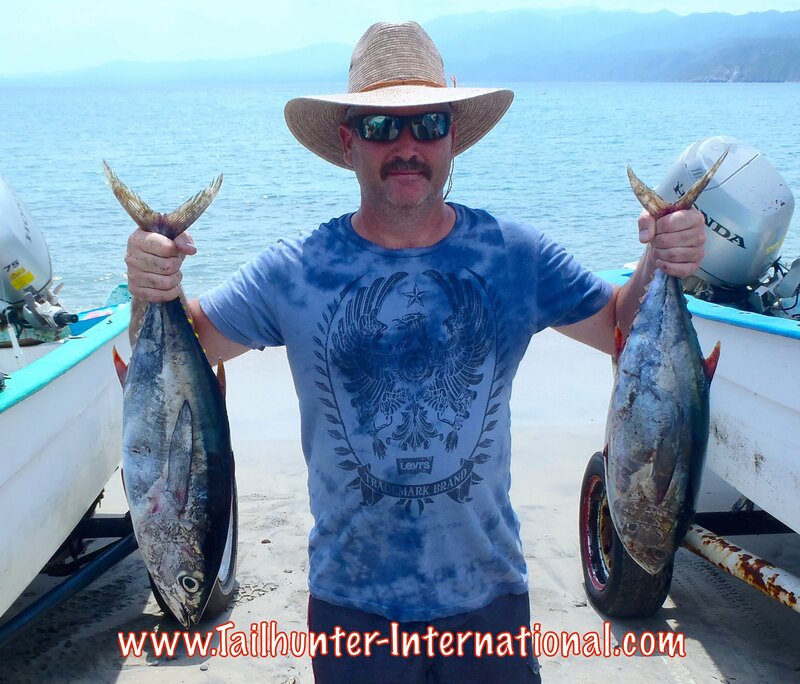 He got the fish in 30 minutes on a small bullito (bonito mated with a tuna). John McVay comes every year to fish for a week and always does well. He’s posing with two handfuls of some of his yellowfin tuna. It was a good week for sailfish. 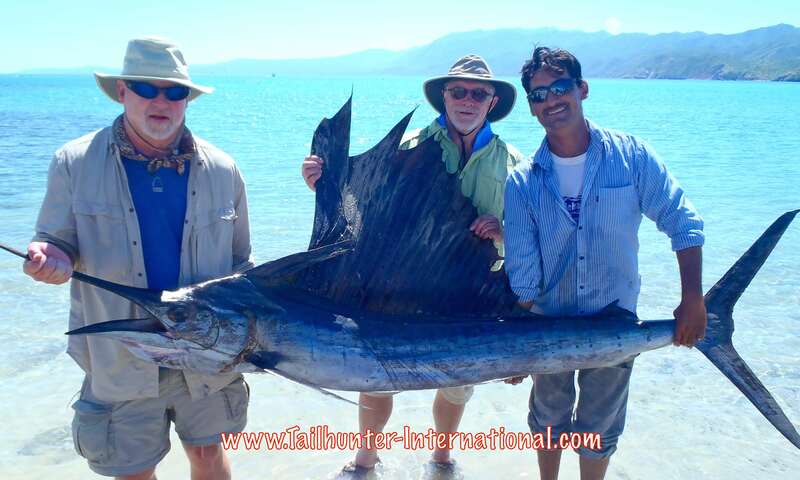 Steve Manney with amigo, Dana Murray and Capitan Adolfo hold up the large sailfish. It was Steve’s first and much of the meat was donated. From San Rafael CA, Kris Honkola got a personal best striper and an assist from amigo, Jeff Klassens for the photo shoot on the beach at Muertos. Yes! There are still wahoo in the water. 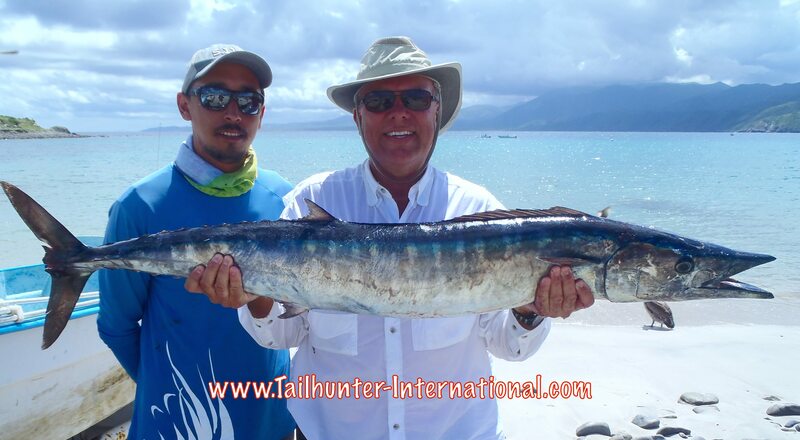 Claudio put a shaft into this fat wahoo early in the week while freediving in the 90 degree water. It’s not that there aren’t dorado around. It’s just that we don’t have many photos because the dorado are so small. 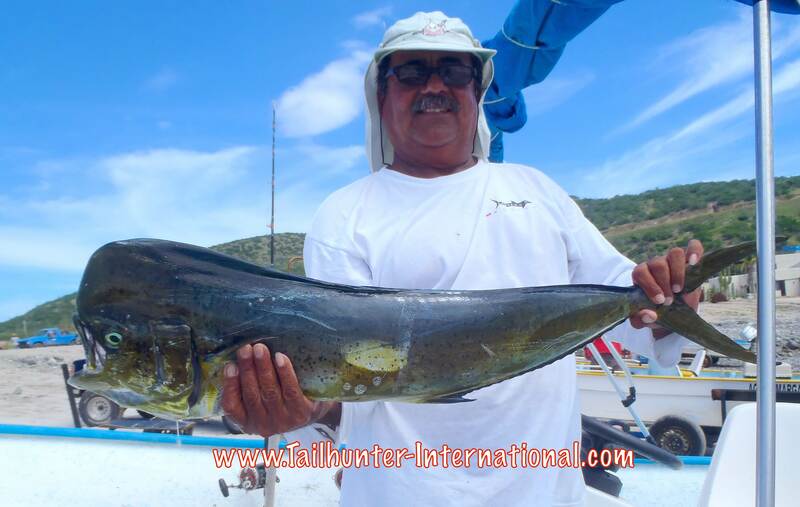 However, Captain Victor took a moment to pose with one of the larger bull dorado of the week. 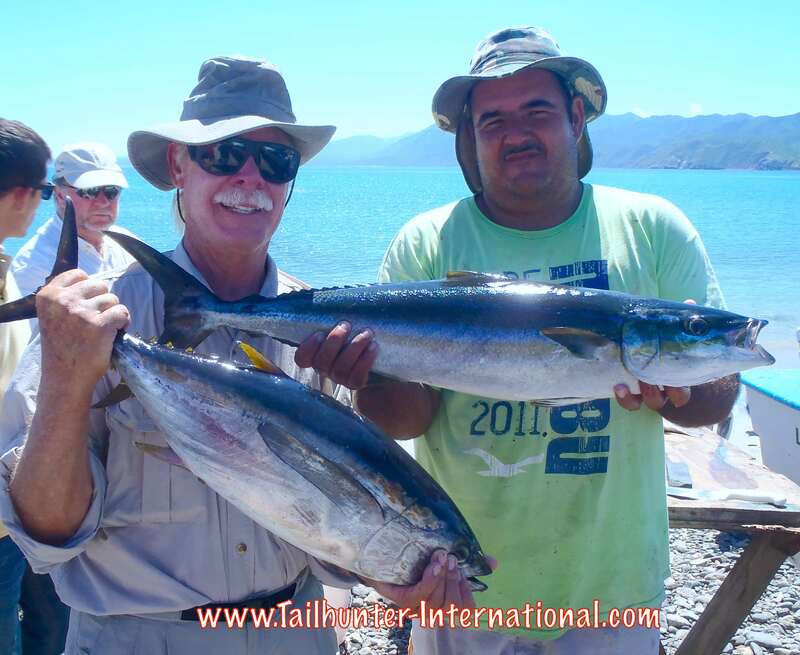 More of our good Washington guys with tuna…Jim Brower and Robert Larson fished 3 days with us in their yearly trip to La Paz. 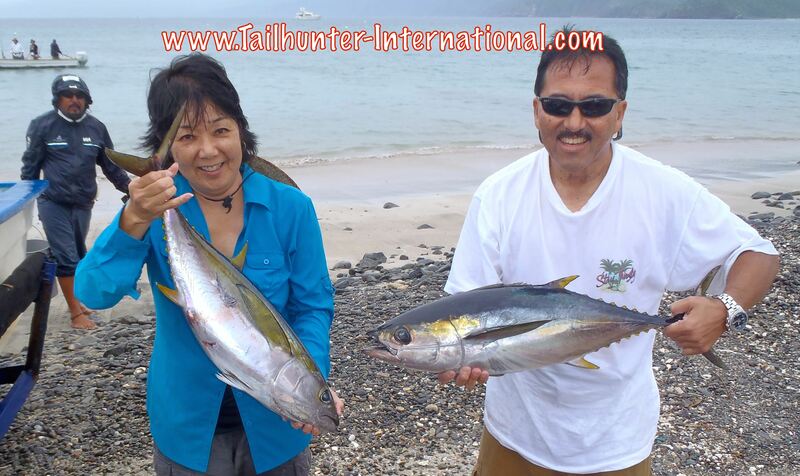 Our friends Jeff Sakuda and Marianne Sugawara have been fishing with us for many years. 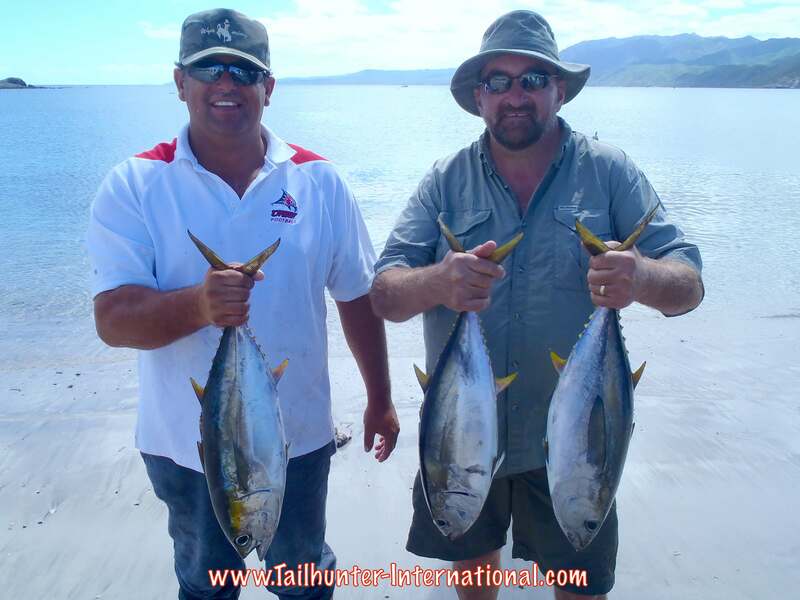 They had some tougher fishing earlier in the week when we had rain storms, but did manage a few tuna to put in the box! We’re about 3 or 4 weeks from the end of our primary season and I guess it’s about time I figure that I will never get a handle on what’s happening this season. I should just give in and give up trying to predict anything other than every day is different and this is an El Nino Year. It’s just fishing and just because something happened yesterday is no bellwether on what will happen today or tomorrow. We had dark nights (really pretty sliver moon!) and great water conditions all week. But the fish, well, they were as erratic and unpredictable as always. There would be in one spot and go crazy one day. Next day, same spot, fish all over…and they would refuse every bait or lure in the water. Or, one boat would sit on a spot and all rods would be bent. The boat next to it couldn’t buy a bite. The next one over also bit. The one next to that one, struggling. Or, one boat catching dorado. The next boat on a sailfish. The next one over on a pargo or cabrilla or yellowtail. It has been that kind of a season. Erratic. Unpredictable. Great. Crappy. Unbelievable. Crummy. Pretty much anything you wanted to say. You just go fish. It’s surely not for lack of effort on the parts of the captains or the anglers. They’ve been going at it hard. It’s just been that kind of a crazy season. Again for the 2nd straight week, happy to say that the yellowfin tuna were the highlight. Football season for the first time in 2 years kept 8-20 pound fish around the pangas and anglers having fun. First, everyone knows about it now, so the waters are getting alot more traffic. Our boats. East Cape boats. La Ventana/ El Sargento boats. Commercial boats. Just like anywhere else in the world. Everyone finds the honey hole sooner or later. So, the numbers-per-rod are down. Most boats getting 1-5 tuna per day. Some better. Some worse. The 2nd issue is that there’s a ton of bonito all over the place. It makes for great action, but after the first one or two, a big nuisance if you’re trying to get through the bonito to the tuna. As soon as a bait hits the water, it gets slammed. Lots of fun. Great on light tackle, but if you’re trying to put some fillets in the box, it makes it difficult. By the way, the sardines are really really small. If you have #4 or #6 hooks…straight “J” style hooks to bring down (if you’re bringing your own tackle) that would be a bonus. Flurocarbon leader is also a plus. 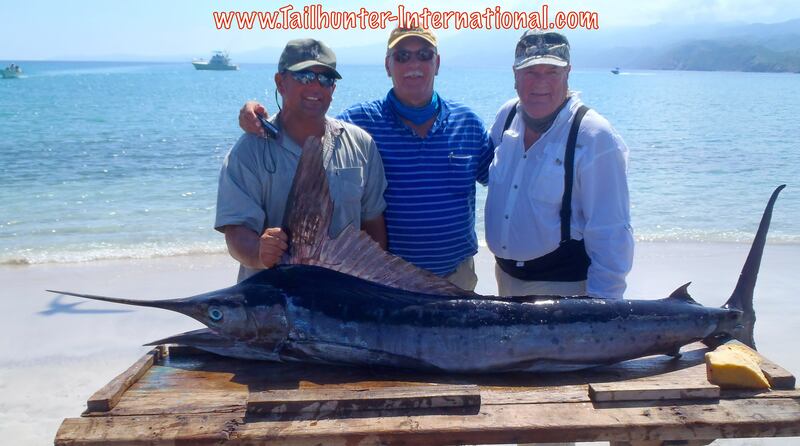 The other highlight was that a number of our anglers got their first billfish this week as well. 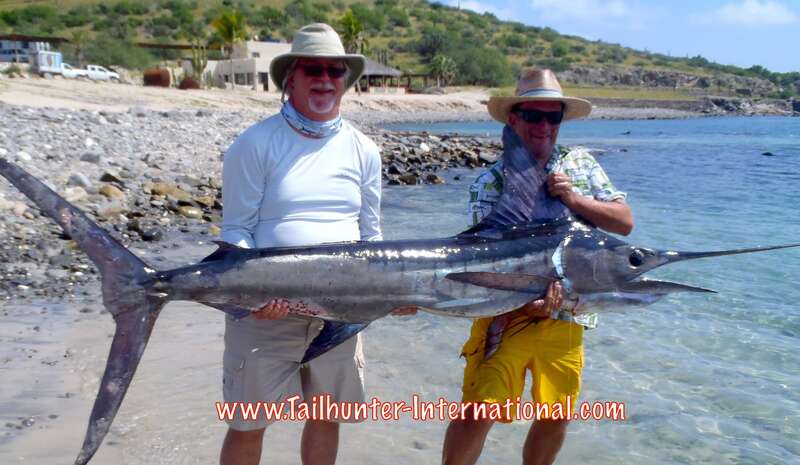 Some striped marlin hooked but also some unusually large sailfish were hooked in the same spots as the bonito/ tuna. This has been our go-to area just for action and filling the cooler because the small dorado have been everywhere all season. The only issue is that they weren’t as cooperative this week and the schools seem to be moving further and further out as the waters start cooling. Also, a few days there were dorado everywhere, but they just wouldn’t bite. It was hit or miss and every day there were different results. I’ve kinda given up thinking we’re gonna see larger fish this year. Normally, our “small” dorado are 15-20 pounders. This year, we rarely see anything over 10 pounds. We’ve been receiving fantastic donations for our schoolkids and the battered women’s shelter all year. Our anglers have brought in over 1000 pounds of donations just this year. 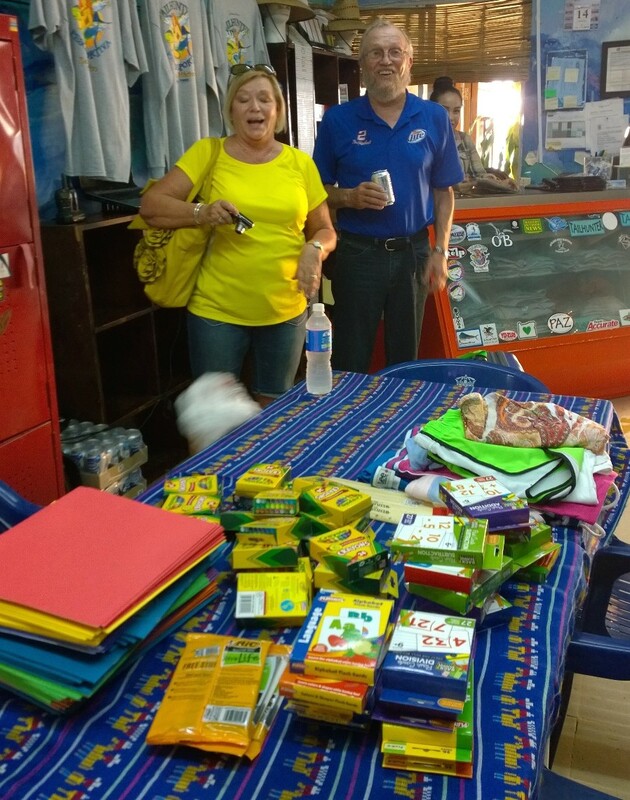 Well, this past week we were completely overwhelmed and blown away by several hundred pounds more of much needed supplies of shoes…clothes…school supplies…hygiene items…toys…books…sporting goods. Just unbelievable. I regretfully, don’t have all the photos of everyone as some of the items were dropped off when we weren’t in the office. However, please know that we appreciate all of you and all your thoughtfulness! 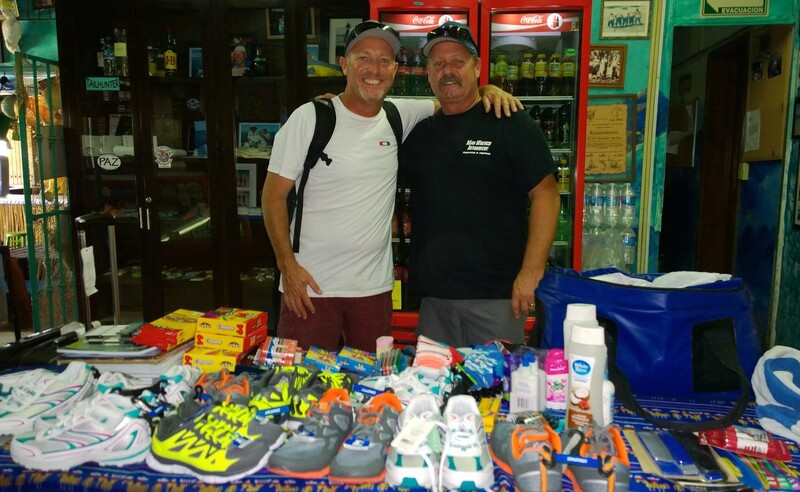 Wiley Randolph and Ken Campbell with dozens of pairs of new kids and women’s shoes…school supplies…hygiene things for women…just bags and bags of things! Good shoppers! Mike and Dena Vonderahe with Heather and Mark Chism from Oregon had so much stuff packed into boxes we couldn’t unpack it all! It just tumbled out. Thanks folks! Al Jones and Victronda Sheasby are here to visit us again this year and we appreciate all their great donations of clothes and school supplies! Just having too much fun! 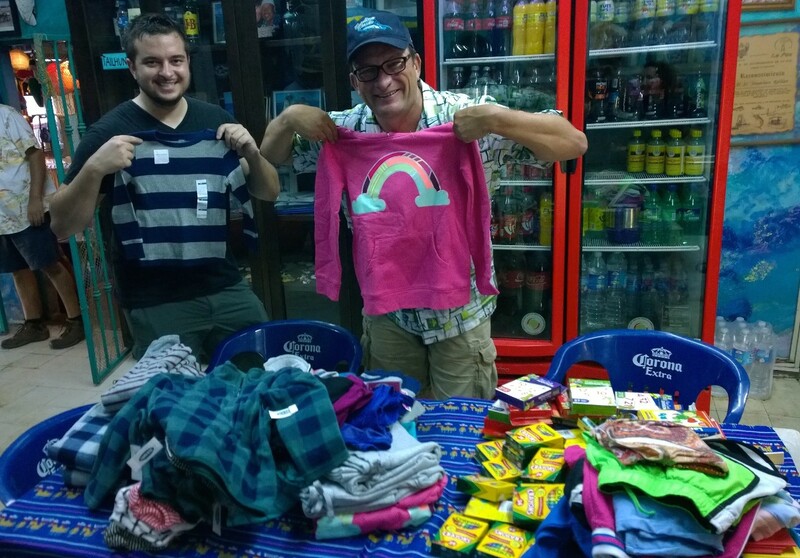 Kevin Pereira and Kris Honkola from San Rafael CA got some warm clothes for the winter months (yes, it gets chilly here in Mexico) for the kids plus school supplies. I think pink is Kris’ color. Gracias, amigos! 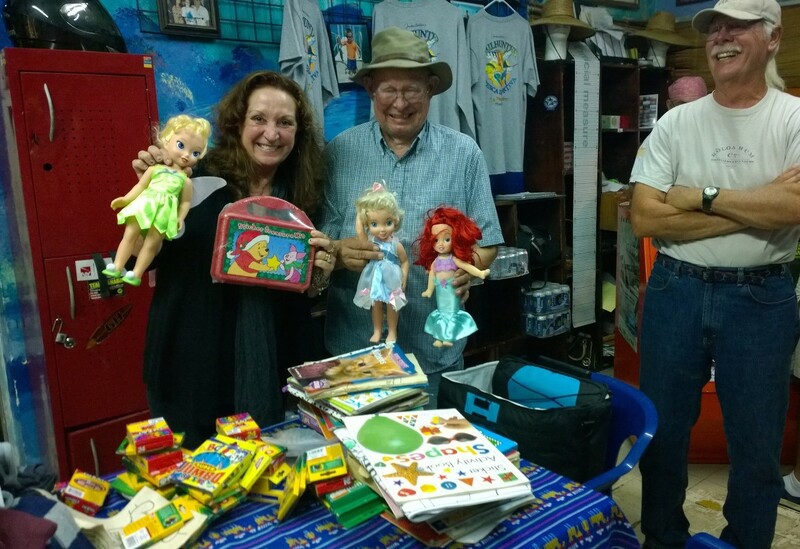 I think Jill wants one of the dolls that Cal Lambert and Chuck Fiola brought down with school supplies and books for the kids! Cal is from Denver and Chuck comes to us from Yakima Washington. By the time you read this the new highway COULD be a reality. Right now, in La Paz, we have no direct flights from the United States, even though, La Paz is the capital of the State of Baja Sur. 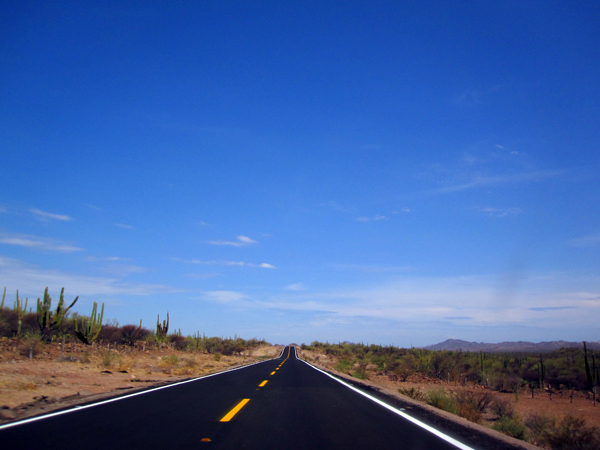 (Southern Baja). So, pretty much everyone must fly to Cabo San Lucas followed by a 3-4 hour drive up north to La Paz. It’s a pretty drive. But it’s tiresome. After an already long-day of travel, adding 3-4 hours of driving isn’t the most fun thing in the world. However, they have completed a new highway that could cut that time IN HALF! Yes…down to about an hour-and-forty-minutes! The problem is, the Governor hasn’t done the official ribbon cutting ceremony! That’s the only thing holding it up! So, they powers-that-be are saying THIS is the WEEK when it could finally be open! We’ll keep you posted. It will surely be great to cut down all the travel time. 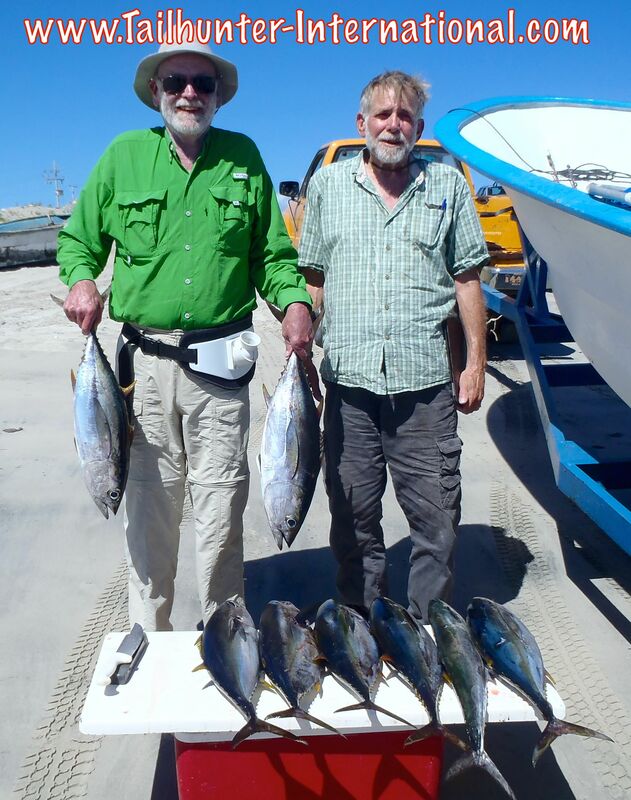 Stan Andre got 6 tuna at Las Arenas then was just inside Muertos Bay only about 70 yards from beaching the boat. He was dragging a Rapala in 10 feet of water when he got slammed by this toothy wahoo! 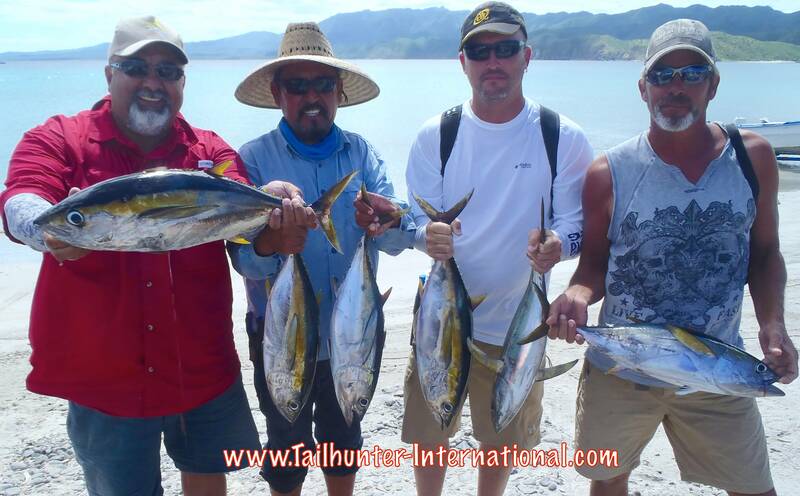 Captain Victor is flanked by some of our regular amigos…Dave Wakabayashi and Lloyd Okimura from Sacramento CA and their yellowfin at the start of the week. 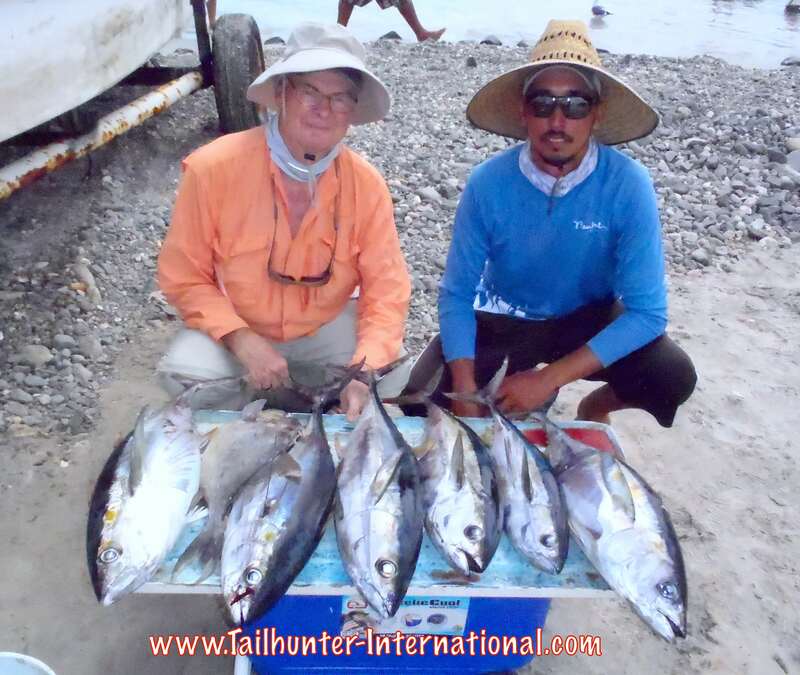 From Cypress CA, brother Danny and Gary Okizaki hung some nice tuna as well as rainbow runners (yellowtail cousins) while fishing out’ve Bahia de los Muertos. Terry Hawk had to postpone his trip last year when we got smacked by Hurricane Odile. He more than made up for it with a great week of fishing. His first day with Captain Pancho he posted a nice rack of tuna. 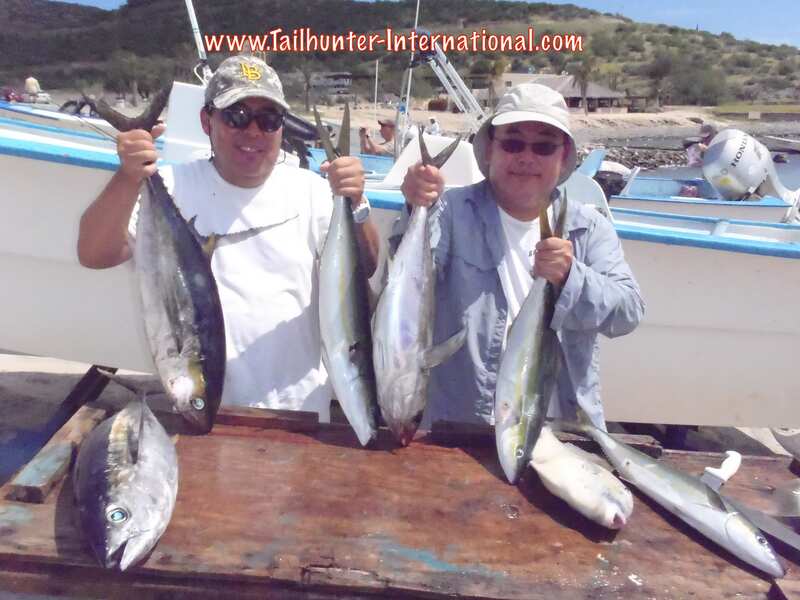 Captain Armando with some of our newest Tailhunter amigos. 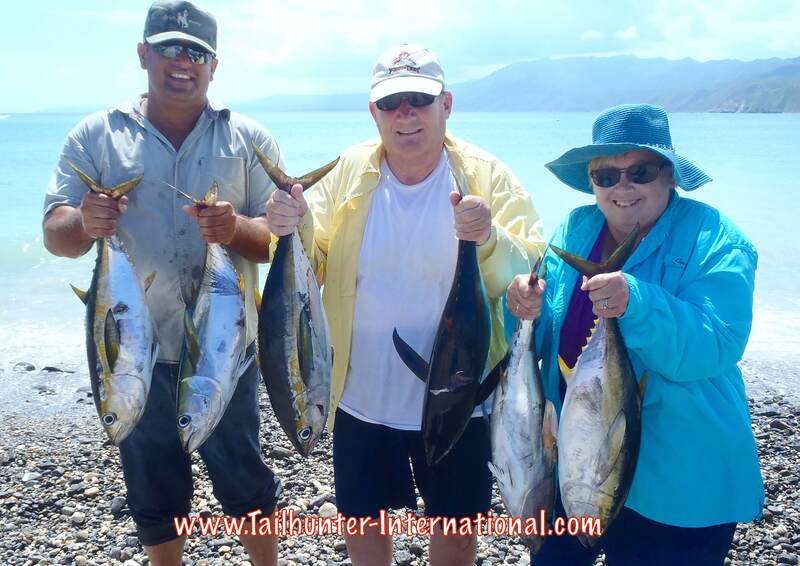 Dennis and Sue Matheson from Kennewick, Washington hold some of their tuna. Dennis used to be an Alaska guide. Hard to find nicer guys than Gary Pilkington. 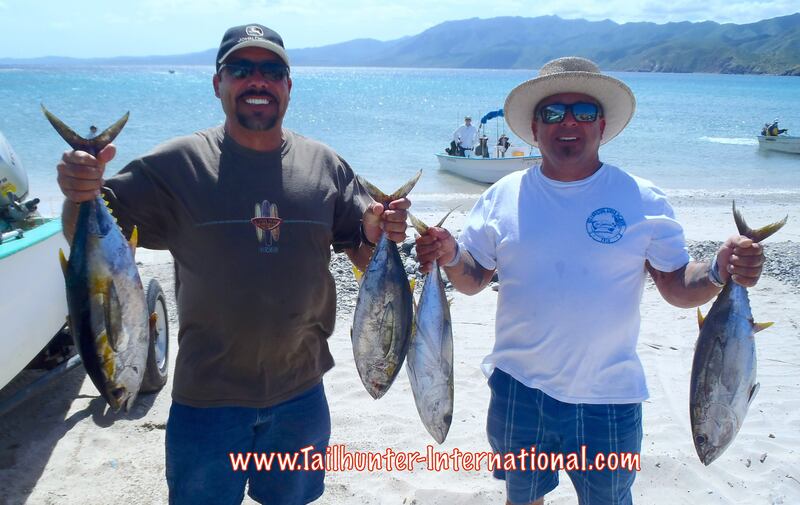 Gary started his week with some good yellowfin fishing out’ve Bahia de Los Muertos. 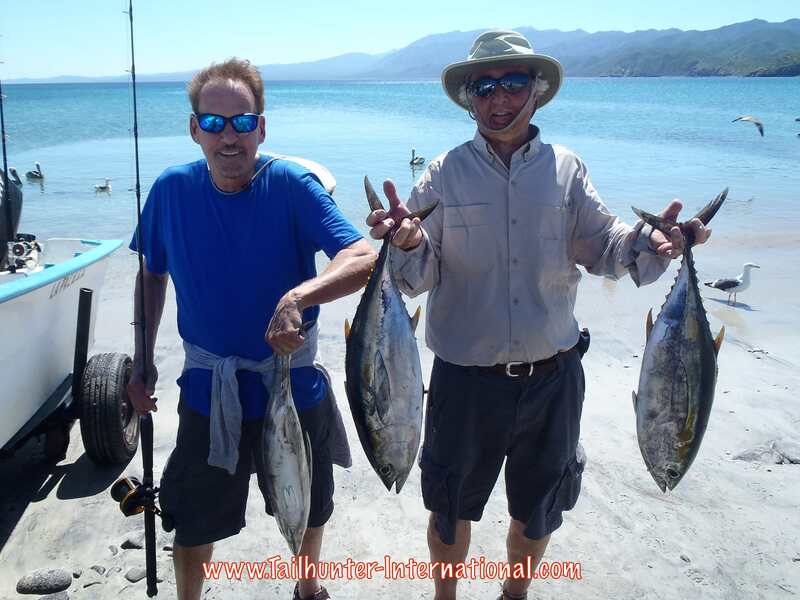 Sacramento brothers, Joe and Dave Kevin were on their first trip with us and had a good first day before weather set in and hold 6 of their tuna with Captain Armando lending a hand. A wahoo is a wahoo, right! 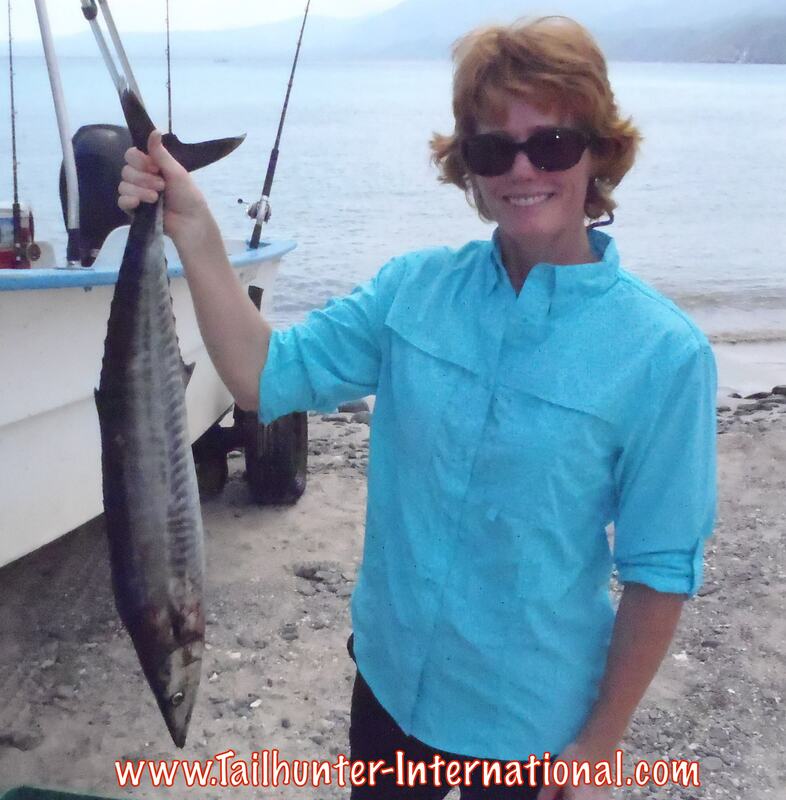 Nicole Lawver was fishing for the first time with us and including tuna also posted this nice little great eating wahoo! Husband Ron got one later in the week. Captain Jorge poses with Lon Tsukamoto and Walt Menda both from Sacramento. ERRATIC UNPREDICTABLE FISHING AND CONDITIONS! It’s pretty much a repeating record these days as far as fish reports are concerned. Fishing and weather this season are simply unpredictable. It rains when it should be sunny. It’s blazing hot when the weather predicts thunderstorms. Dorado bite like crazy in one spot then the next day it’s like looking for a missing sock in the dryer. 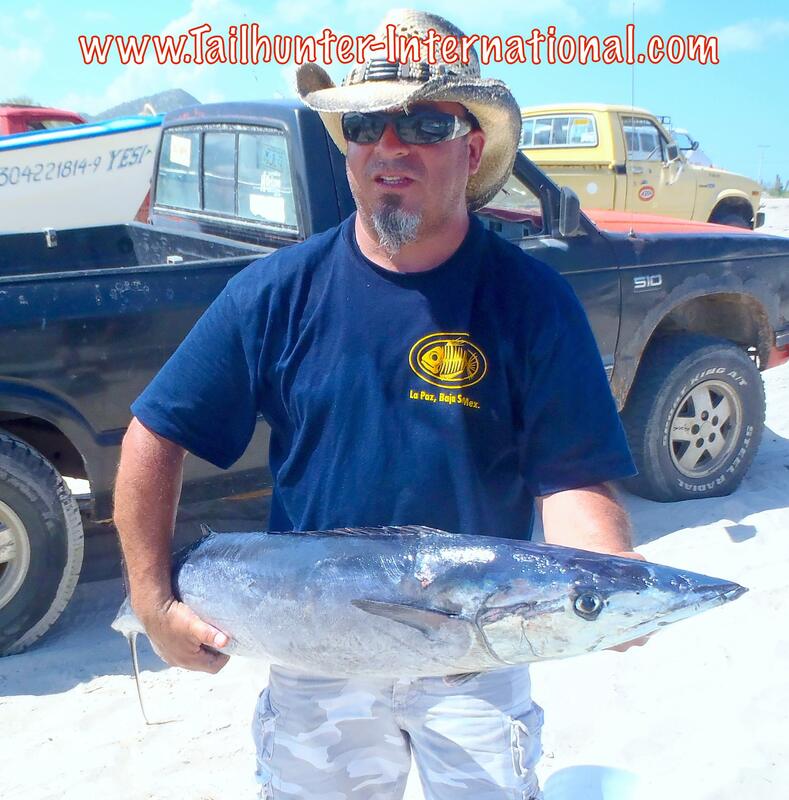 You go fishing for pargo and you catch a wahoo. A spot that hasn’t yielded fish all year starts raging with foaming fish out’ve nowhere. The water is about 90 degrees and we catch fish that are supposed to be in cooler winter and spring waters. Fish like tuna that we haven’t seen in two years suddenly pop up and go on the chew. Extreme high tide. Extreme low tides. Eclipses and giant full moons. What next? A sign of the apocalypse? Nah. Not quite that serious. Alot of it has to do with the El Nino. You just go fish. It is what it is. It’s a cycle we have to push through until the next cycle. The world has been doing it since…well…a long time. It still beats working. 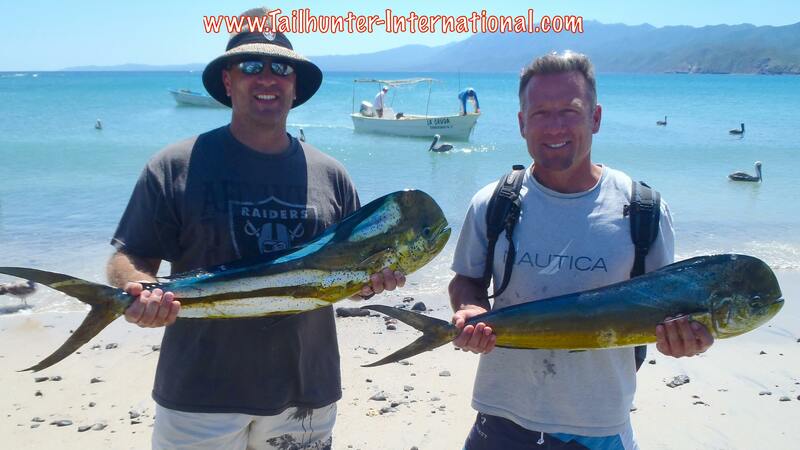 If a spot had been worth fishing this past week, for once, it was with our Tailhunter Las Arenas Fleet at Muertos Bay. Historically, this time of year, the area is on fire. But, the past two years because of El Nino, bait has been an issue. Fish have been sporadic. Until about 3 weeks ago. Bait showed up. And we started getting more dorado. More billfish. More pargo, cabrilla, sierra and yellowtail (wrong time of year, but who cares? ), more jack crevalle and bonito too. The baits are very very small, but it’s better than nothing. They worked. Still not wide open by any stretch and there are THOSE days when it truly is scratchy, but comparatively speaking, there was action to be had most days. And then, the football yellowfin tuna appeared about a week-and-a-half ago. And that changed the game. We haven’t seen tuna in 2 years. We started getting 4, 7, 9 or more tuna per boats. Nothing huge, but still fun 8-20 pounders. Perfect for most folks! Mix that in with a few dorado, lots of bonito, some billfish and it made for a fun day. I have no idea where the rooster fish have gone to. But no one eats rooster fish. And the tuna and other species filled ice chests nicely! 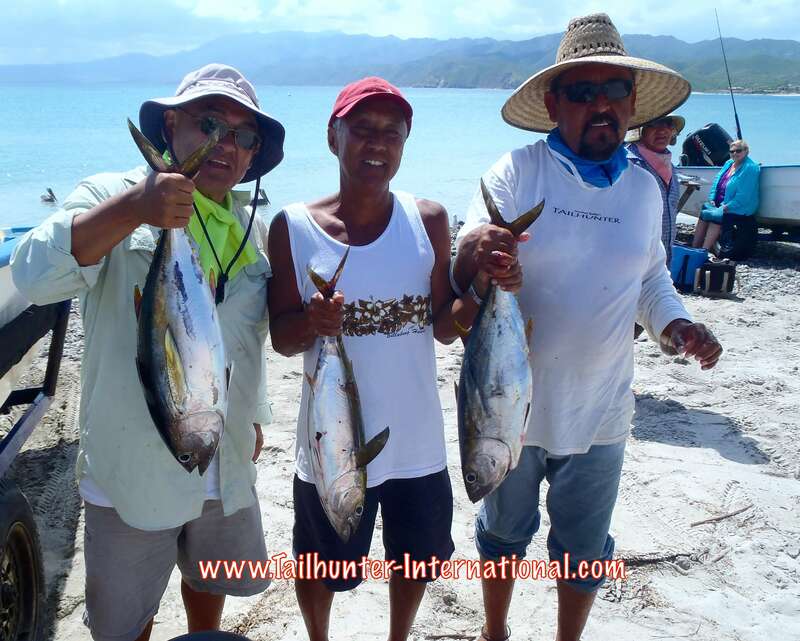 Plus lots of our anglers were bringing us tuna to the Tailhunter Restaurant to cook and make into sashime and poke! All season, La Paz has been our go-to spot. If nothing else, there was always bait and the dorado were always accommodating. There was always action because even tho’ the dorado are small by our standards, they bit ravenously many times, or at least by the end of the day, you had a full box of them plus the huge bonito (larger than the dorado) were worth the battles. This week, I could only describe the dorado bite as anemic. 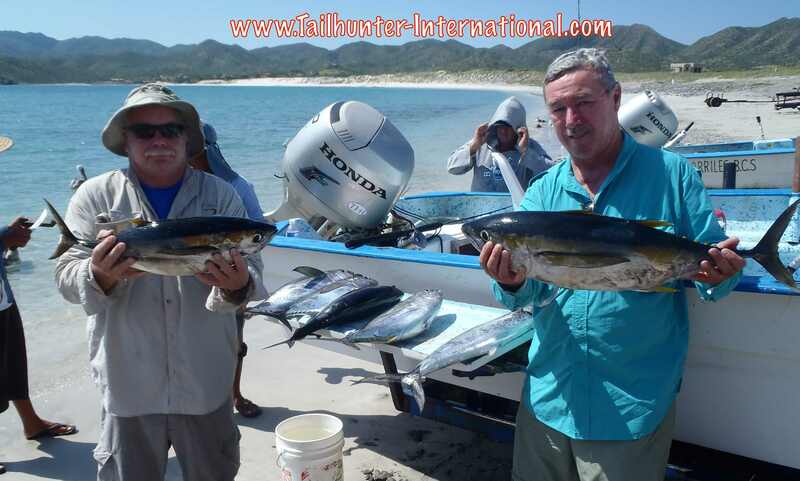 One day every panga would be slammed and many back early with good numbers of dorado. The next day the pangas would be back telling me they barely scratched out a handful of fish. The day after that, half the boats would have solid numbers and the others fishing the exact same spots would struggle. Again, that word…unpredictable. Oh…and one panga got a huge wahoo. Out’ve nowhere. First one of the season. Why? Where? Why now? And, as I write this report, the sun is out. But it’s raining. And the stupid weather report said no rain at all and it would be sunny. They were half right. Looks what popped up! We haven’t seen anything like this in several years! Tuna! 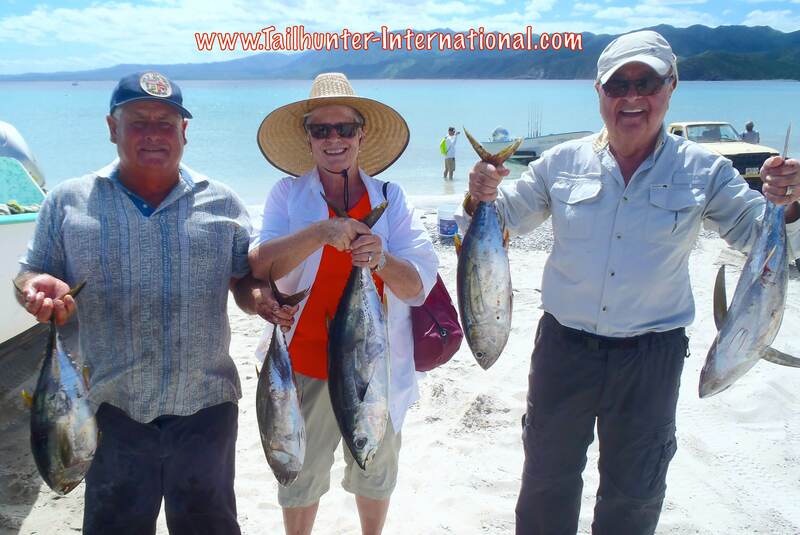 Ben and Shawn Kirk from Timnath, Colorado and ROGER ( “aka GEORGE”) and Marilyn Young from Mountain View, Missouri with several handfuls of yellow”fun” tuna footballs taken just south of Bahia de los Muertos. 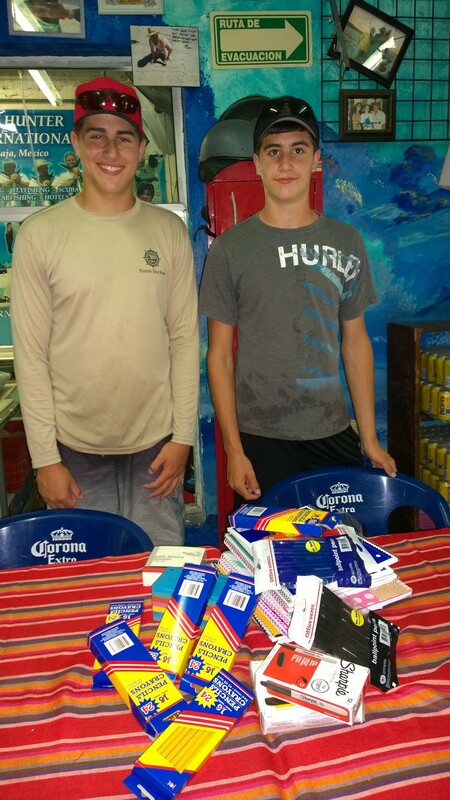 From the Portland, Oregon area, first time visitors, 13 and 15-year-old Matt and Josh Mitchell had a pretty good day fishing with dad out’ve Bahia de Los Muertos taking tuna, rainbow runners, pargo and cabrilla. 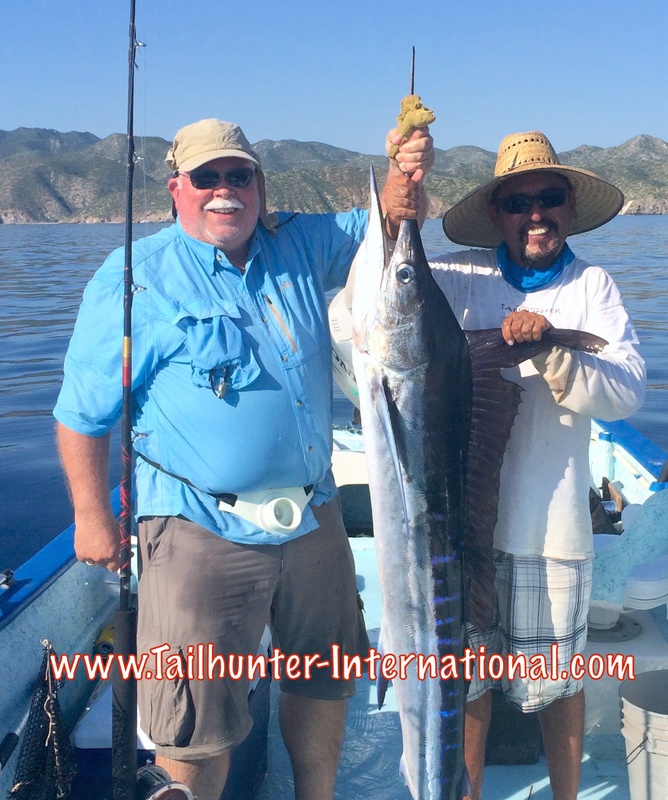 Cross one off the bucket list for Mark Smith with Captain Adolfo as Mark hoists his first wahoo that he caught on a purple and black Rapala. Mark also got his first tuna as well. One guy who had one of the best times this week was Dan Corcoran. 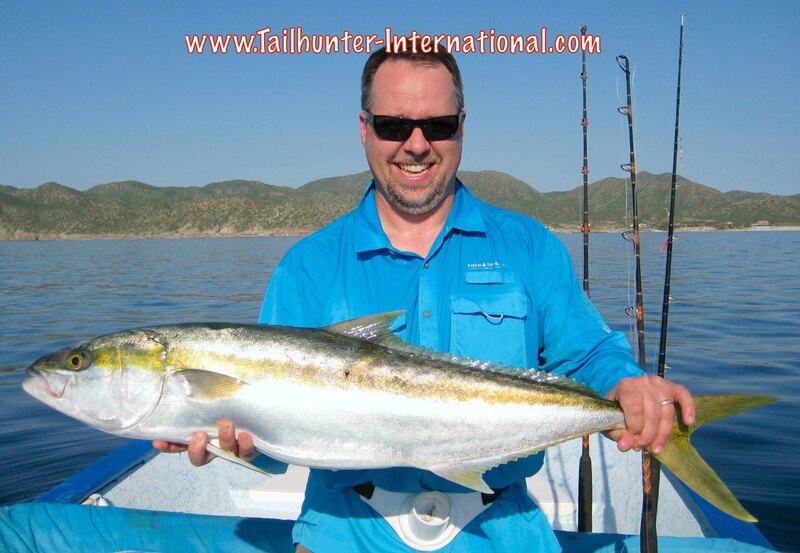 From Folsom, CA, Dan dialed up a nice trophy yellowtail which is very unusual to see these fish in such warm waters! MIke Corcoran had some kind of week with about 7 different species of fish including this striped marlin with Captain Jorge. He also got a sailfish later in the week. The marlin was not able to be released ,but meat was donated. Sacramento firefighters Greg Quick and Greg Lack with a couple of their mid-week dorado. More dorado showing up some days out’ve Las Arenas. First tuna of the week that started things. I thought it was no big. Just an isolated thing but then the tuna came strong a few days later. However, good amigos Tim Nishimura and Eric Manson show off a couple of footballs and a dorado. All the way from Montana, Curtis Wells and Captain Pancho with some of the nicer dorado of the week. 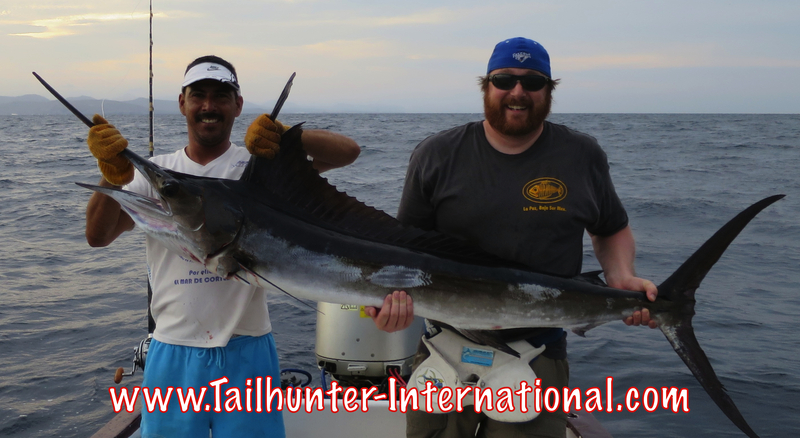 Curtis ended his week with his first sailfish. Tom Cox from Colorado was visiting us for the first time with his family and poses with a couple of yellowfin tuna that are headed for the freezer. 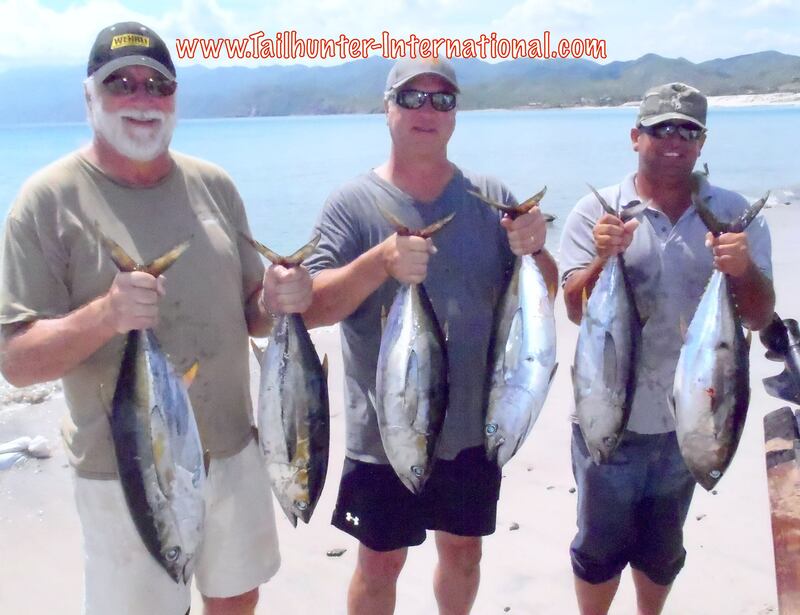 ERRATIC UNPREDICTABLE WEATHER AND FISHING…AND TUNA? I’m not sure where to start with the report this week. There were so many changes…so much variation…so much variety…so much unpredictability and ups-and-downs that each day deserved it’s own report. It was great fishing or bad fishing depending on who you talked to. It was great weather or bad weather depending on who you talked to and where you fished. There were so many variables that affected the fishing every day. So, you add in all that stuff and it was impossible to tell what the fishing day would be like. That’s not to say it was bad. There was some really good fishing actually with some big surprises! But, there were some really slow days as well. Captains worked hard. Clients worked at it hard. But the fish just wouldn’t go. For the first time in two years…TUNA!!! We got a little tickle early in the week and I didn’t get excited. 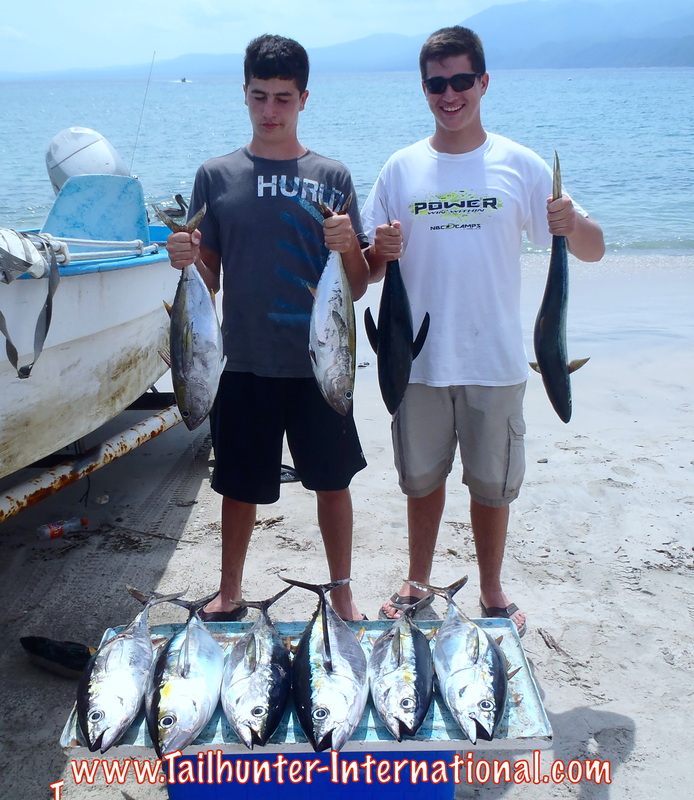 However on FRIDAY, the tuna schools blew up on our pangas just south of Bahia de los Muertos. Fun footballs that we call “yellow’fun’” tuna! These were 8-12 pound fish and it was WFO…all you wanted. We have not seen a day like that in two years! All live bait. Now that was something to get excited about. But then…the next day Saturday is the day the weather changed on us and we had the big rainstorm. Guys told us the fish were “foaming” and biting everywhere. They just weren’t biting the hooks! We only got 2-5 tuna per boat. As of the writing of this, I have no idea what will happen. On Sunday, the day after the storm, we couldn’t send out any pangas from Muertos because the roads were all washed out and the beach was a mess plus the water was all turned over and dirty. Stay tuned! 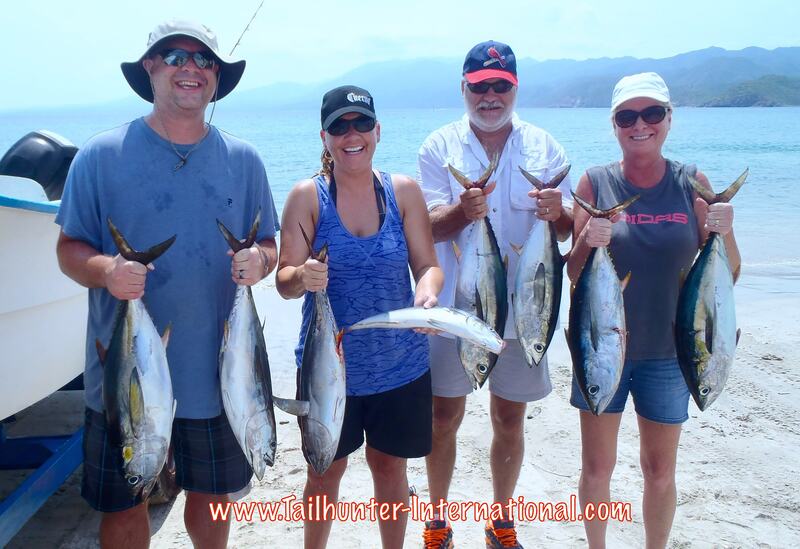 On the other news…there were numerous marlin and sailfish hooked up during the week and while the tuna were there. Plus dorado and some inshore rock species. Oh and few unexpected wahoo as well. The rub was that, it changed from day to day. One day crazy good. Next day you had trouble buying a fish! Or, two pangas would have fish of a lifetime catches and the other pangas right next to them would be sitting there trying to scratch out a single fish. Like Las Arenas/ Muertos Bay, the fishing was unpredictable and erratic. You could load up on all the dorado you wanted and be back on the beach by noon drinking beer in the hotel. Or…you could be the boat right next to it and get two dorado and a bonito all day. Or be the panga that hooked 2 billfish, but couldn’t find a single dorado. Or be the day that La Paz fish just weren’t biting and you find out you should have fished with our Las Arenas fleet instead! Luck of the draw. Luck of the weather. I really felt badly for some of our folks who just happened to be fishing on the wrong side on a given day or were the boat that worked hard for fish, but it just never went off. You could have a group of guys and some go home needing extra ice chests for all their fish. Their buddies end up barely filling a single ice chest! Felt bad for the anglers as well as the skippers who worked really hard to put fish in the boats. 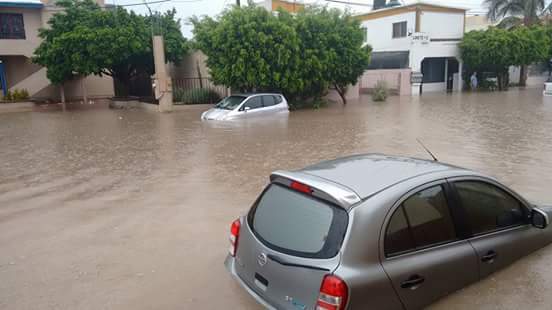 The photos above, courtesy of Clima La Paz are from downtown and show what a few hours of torrential rain can do. All the weather reports predicted was there was a “chance of a thunderstorm” Saturday afternoon. Wow…what an understatement. It crashed like a mac truck into the city. It rained in sheets and buckets with huge rips of thunder the lightning. Within 10 minutes, the storm drains were backed up. The force of the water was blowing manhole covers up into the air. Cars were stalling in the streets that turned into roiling rapids. 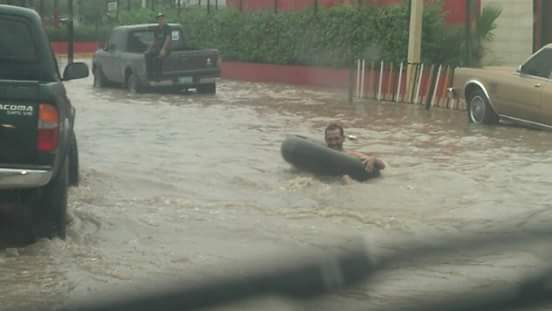 Motorists were stranded and people were swimming across parking lots. There were landslides, falling holders and collapsed roofs. The water was coming down so thick that visibility was cut to only a few feet. 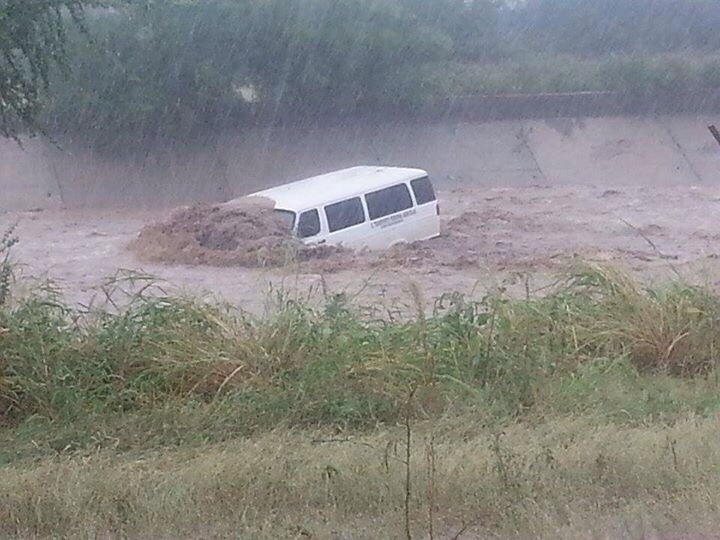 Some vehicles were swept away. There were crazy kids riding tubes, boogie boards and kayaks down the rushing streets that flowed into the ocean. People became trapped in their homes, buildings or on blocks that became isolated by flowing rivers of water. Then, it suddenly just stopped. 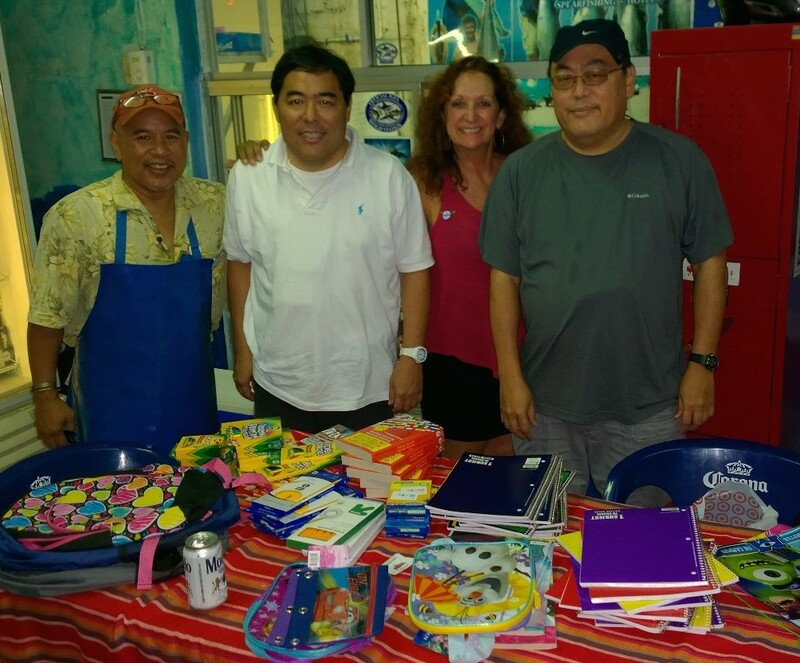 Dan and Gary Okazaki from Cypress CA with a big load of school supplies for the kids. Josh and Matt Mitchell from Portland Oregon…thanks for the thoughtfulness, guys! 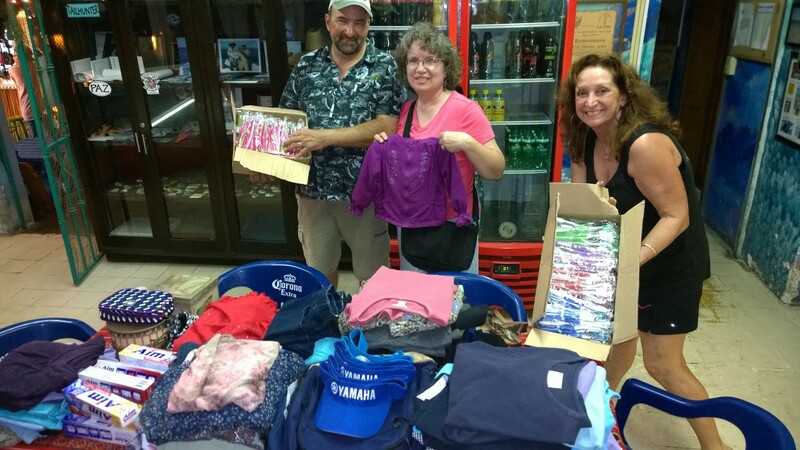 Many thanks to all of our amigos who brought down supplies, clothes and other great items for our “Pack for a Purpose” program to help disadvantaged school kids and also the local women’s shelter! You have great hearts. Not shown, but thanks also to Shawn and Ben Kirk from Colorado and George and Marilyn Young from Arkanasas and Ken Cavellon from Washington. As well a big shout-out to Vic Patton who made a cash donation to our scholarship program as well!